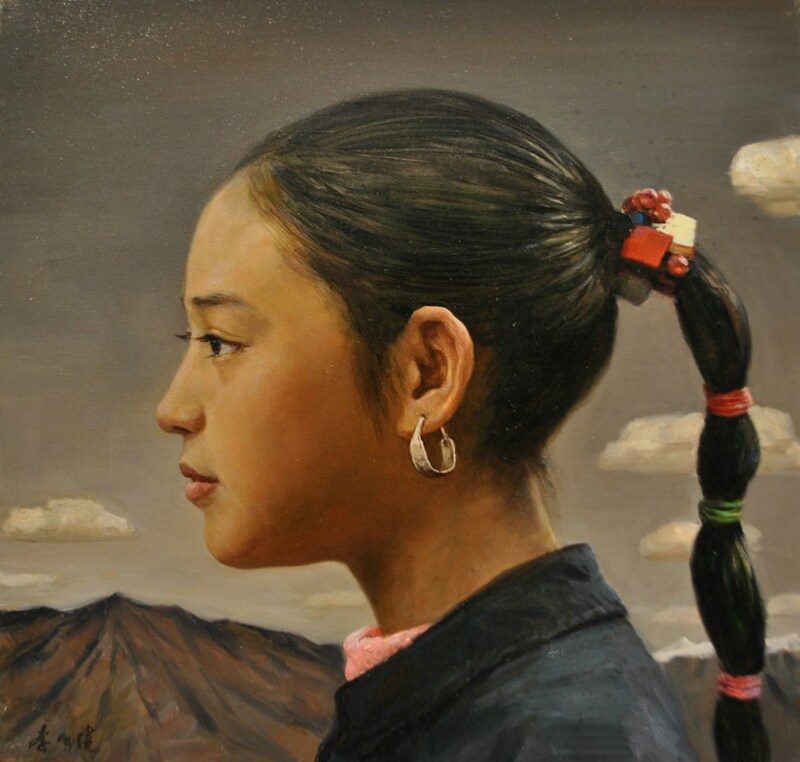 The name of Li Zijian, a US-based Chinese artist, is not new to Chinese who are interested in arts and humanity as his works, with the themes of humanity and love, have moved lots of people, especially his historic painting of Nanjing Massacre. 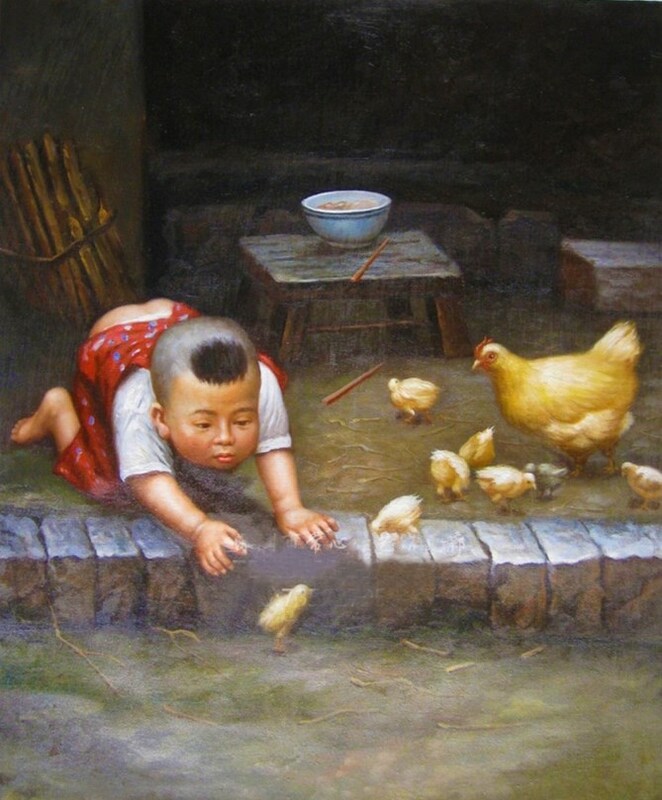 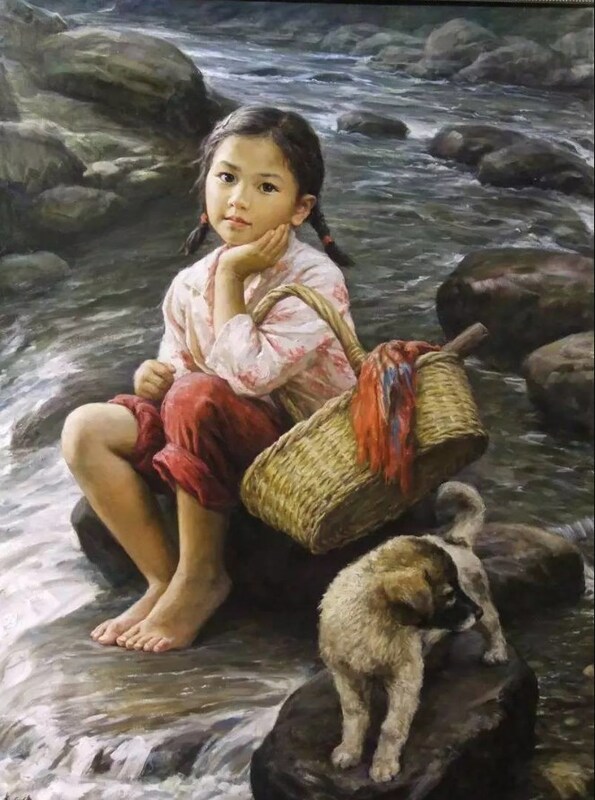 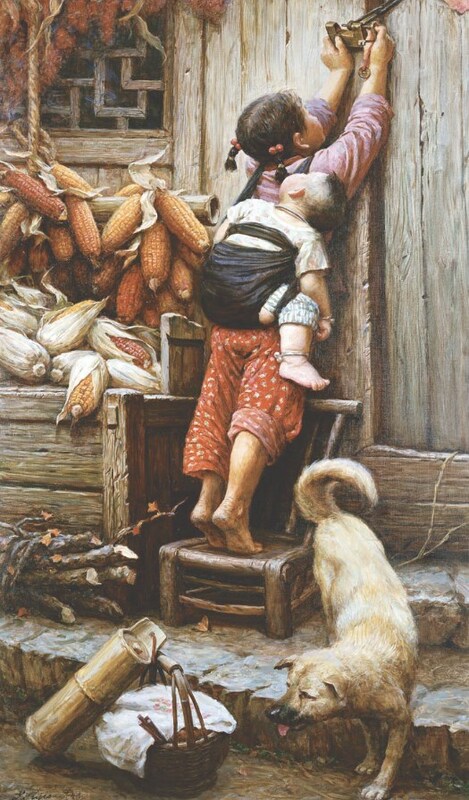 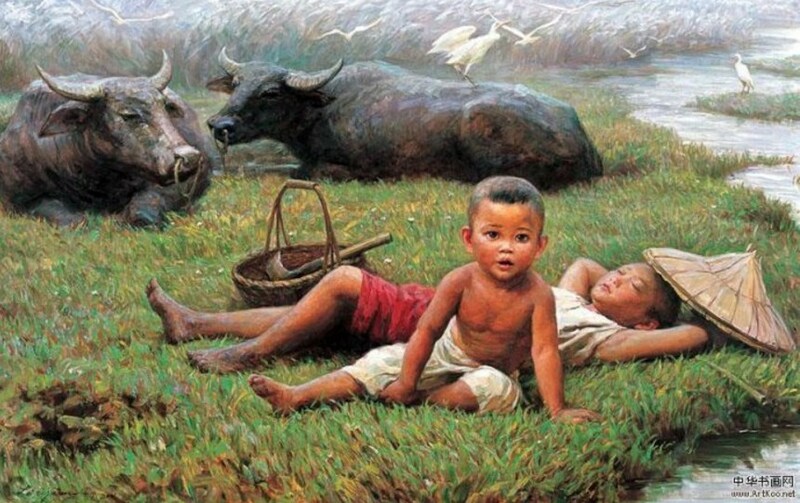 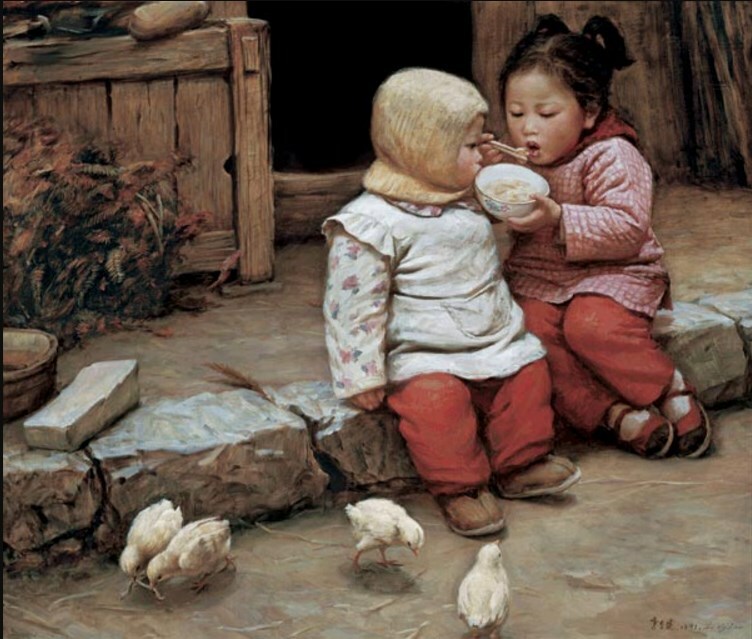 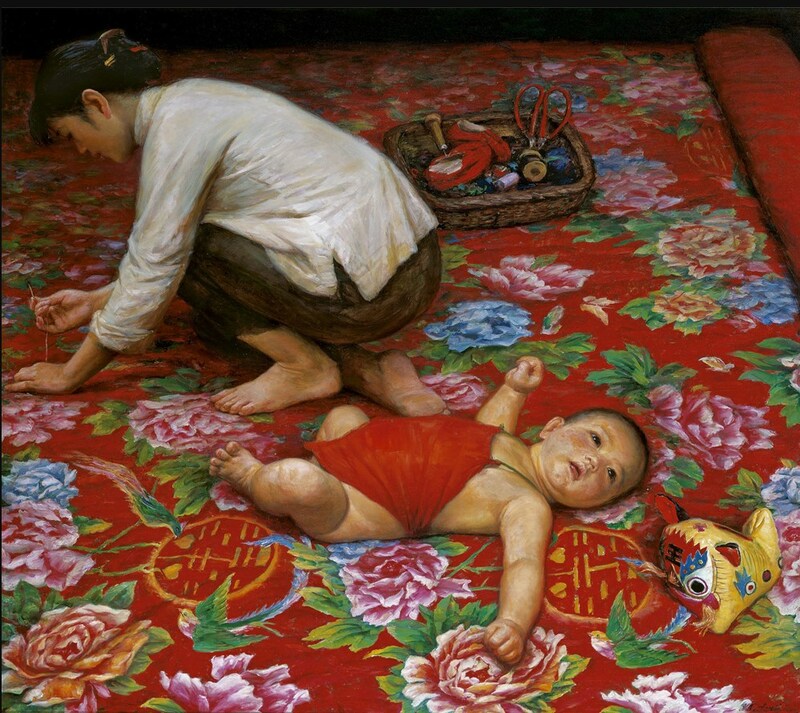 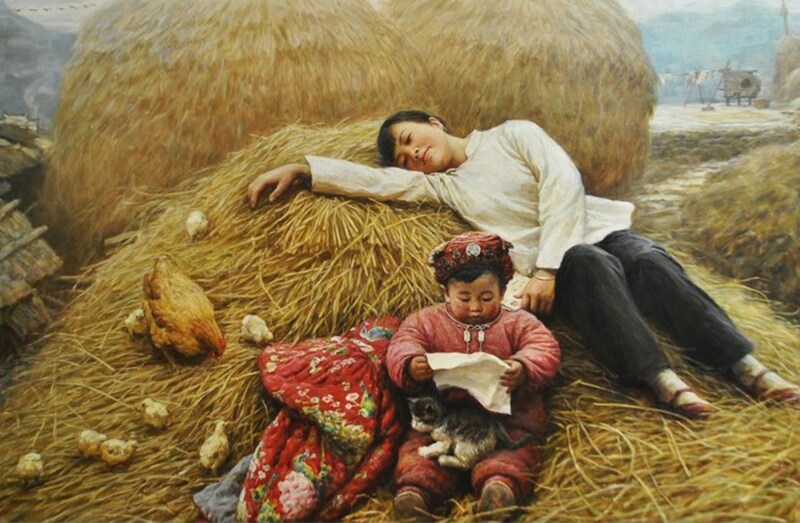 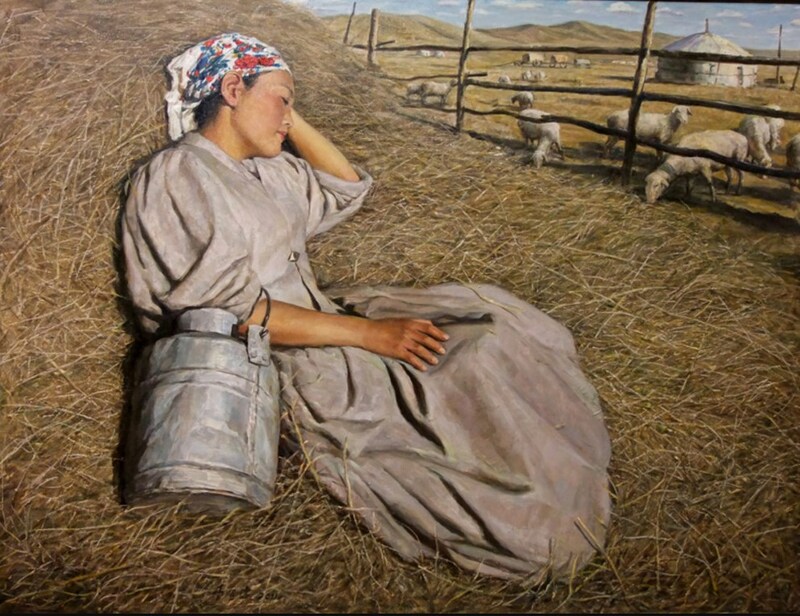 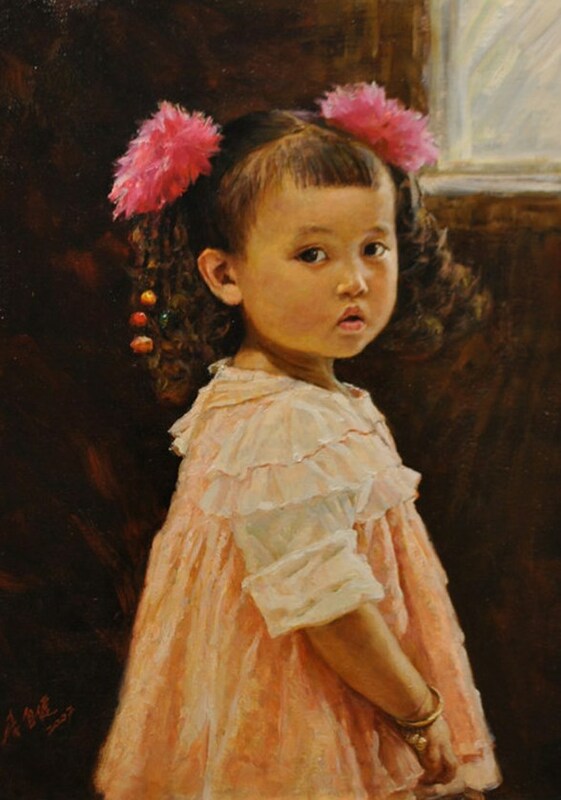 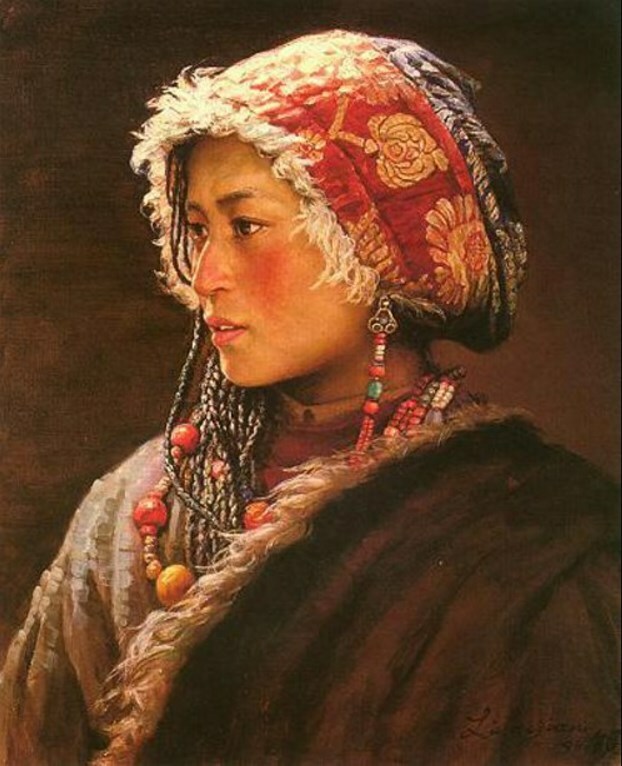 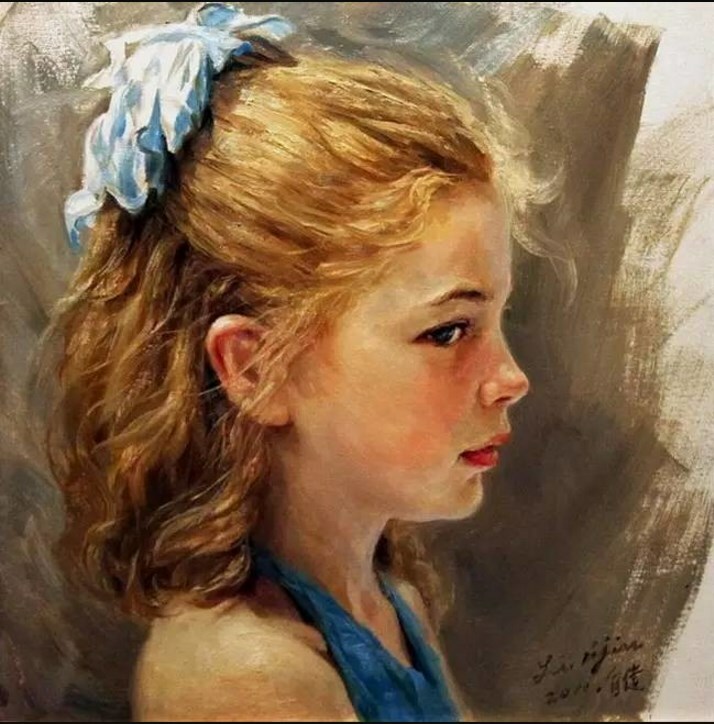 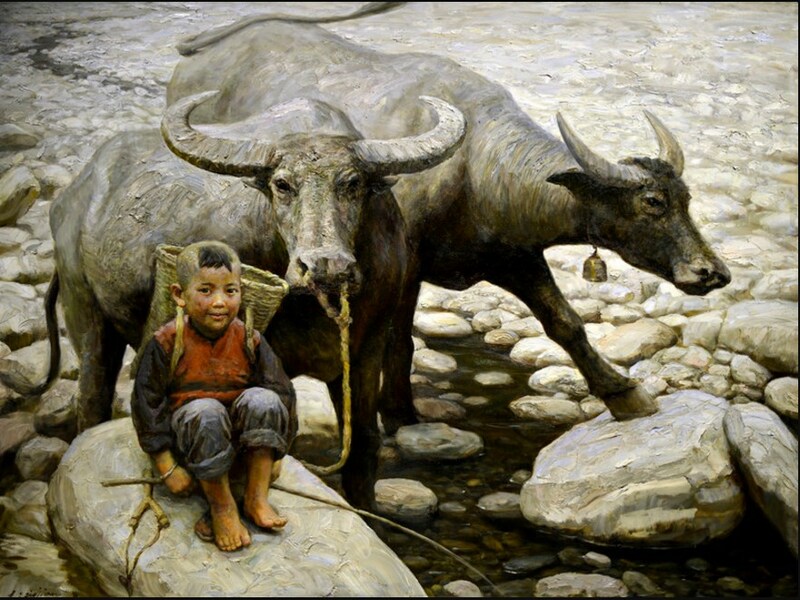 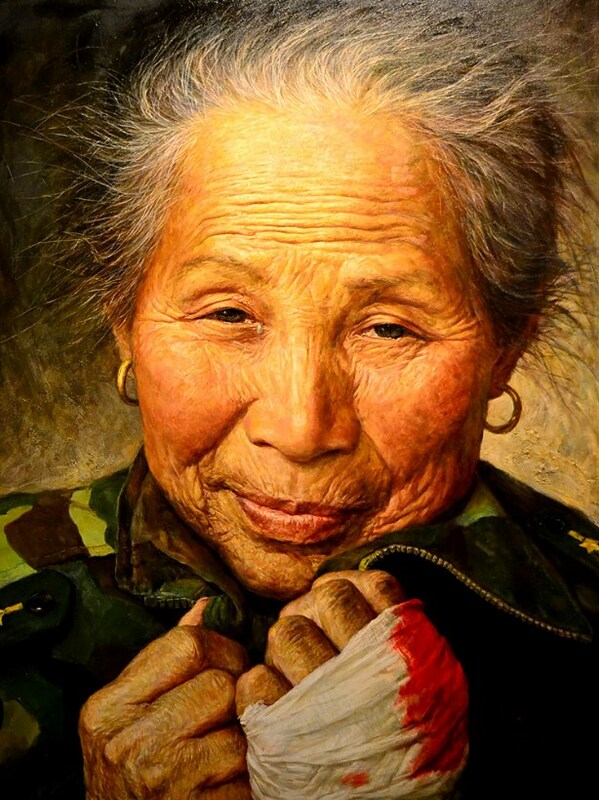 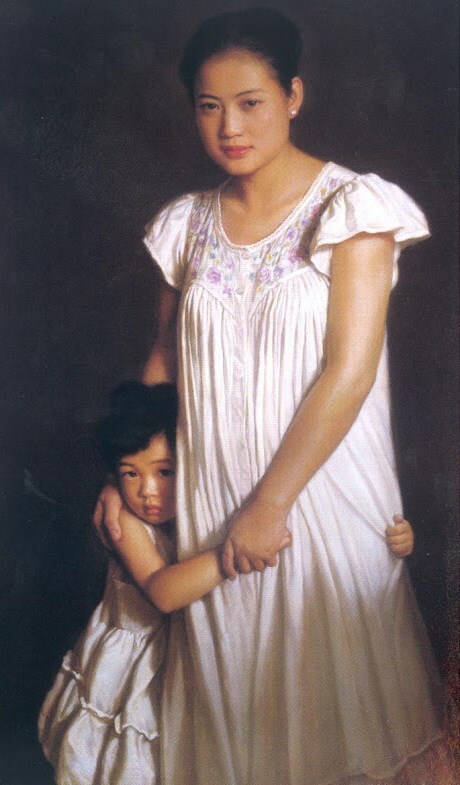 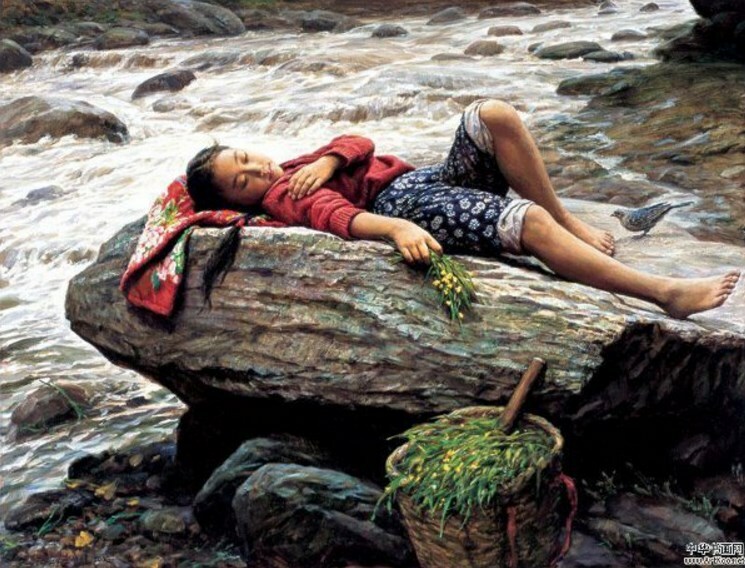 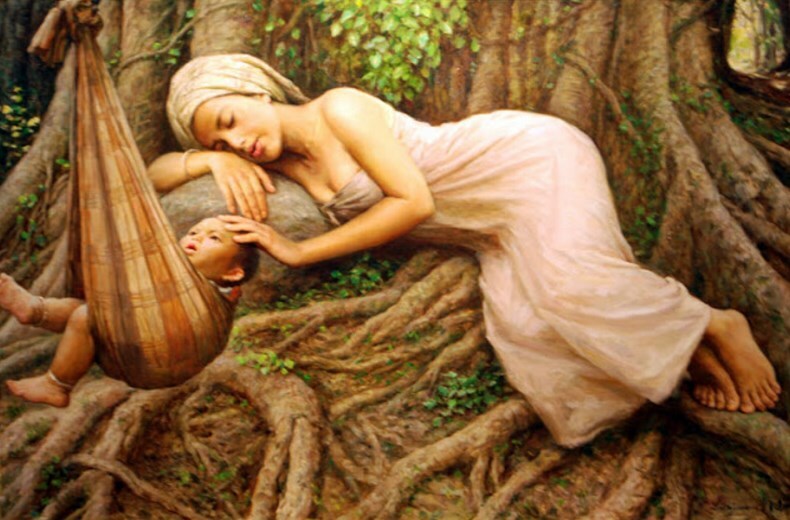 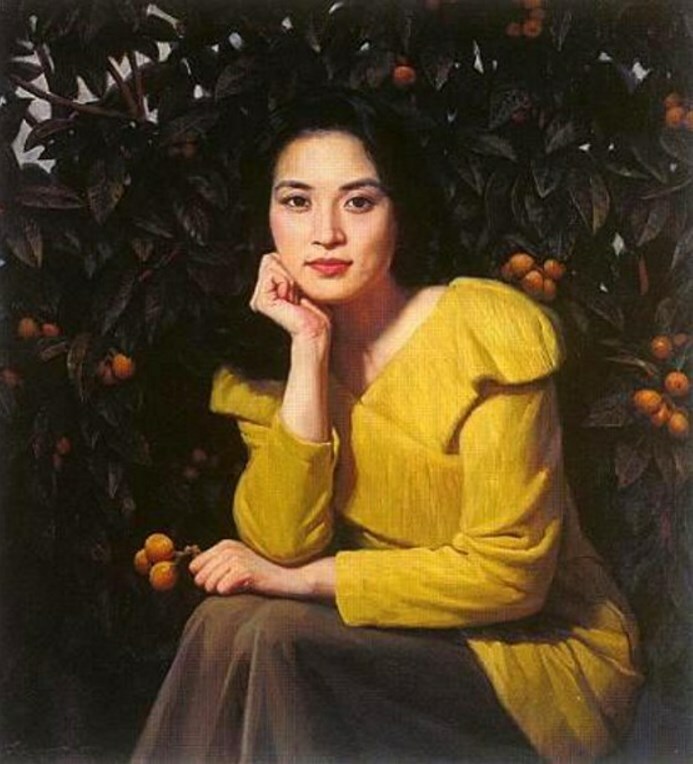 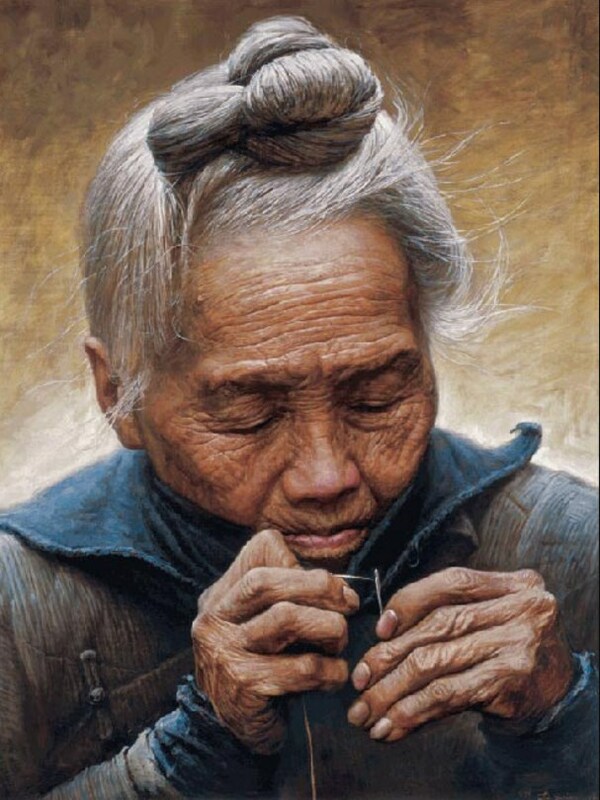 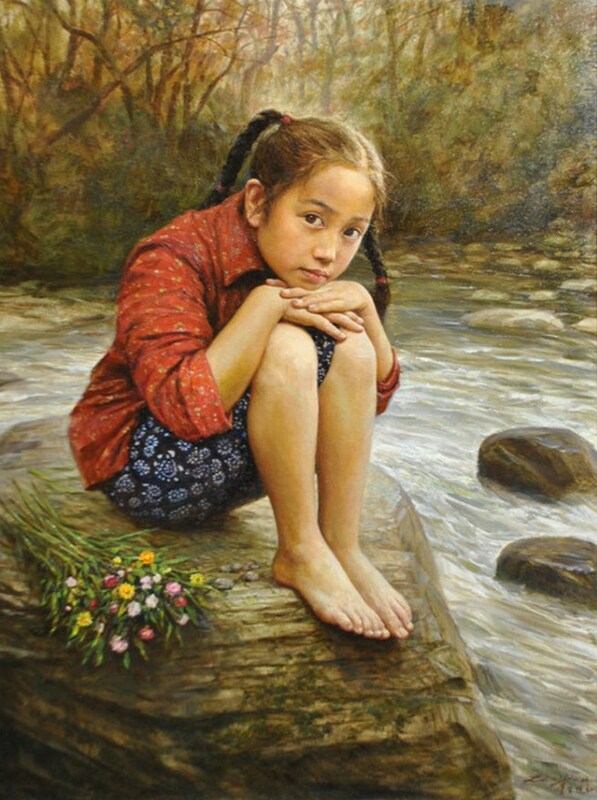 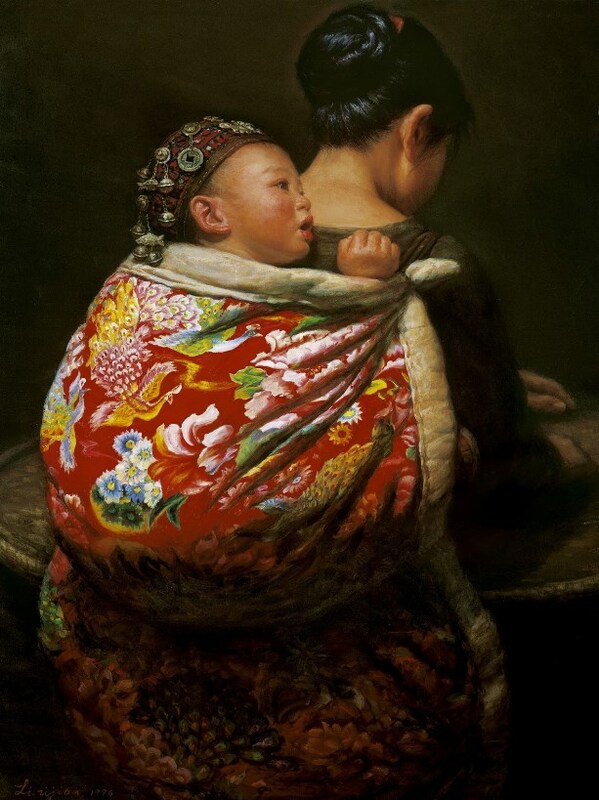 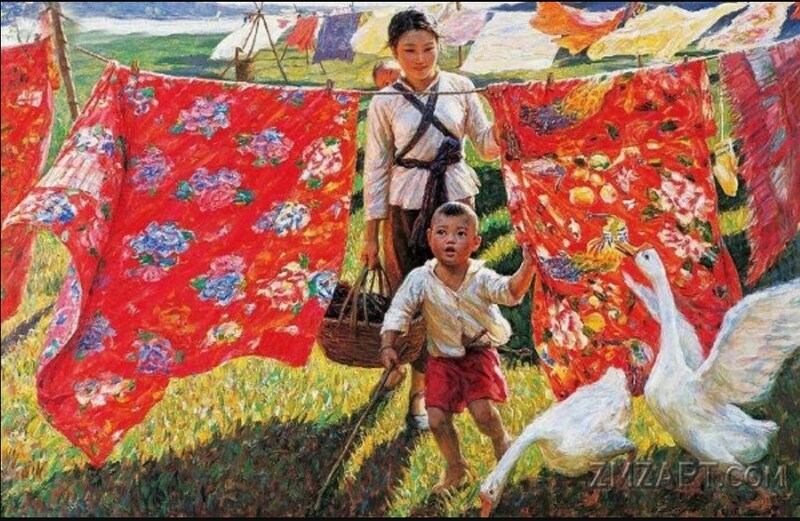 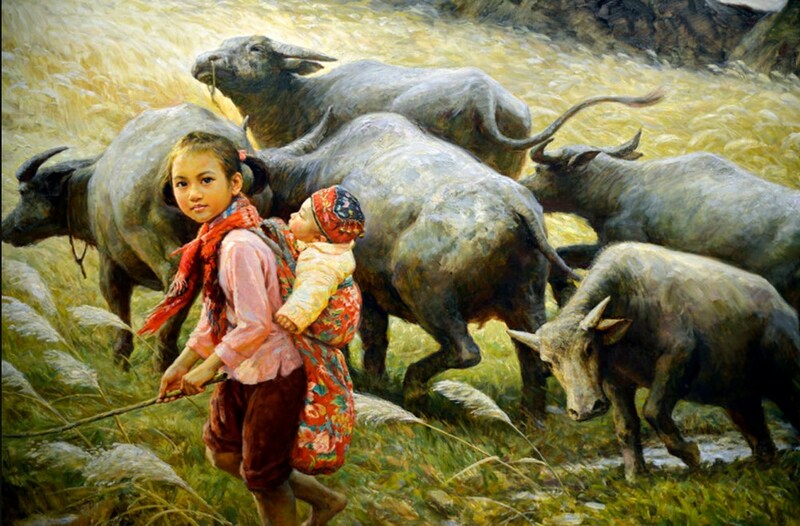 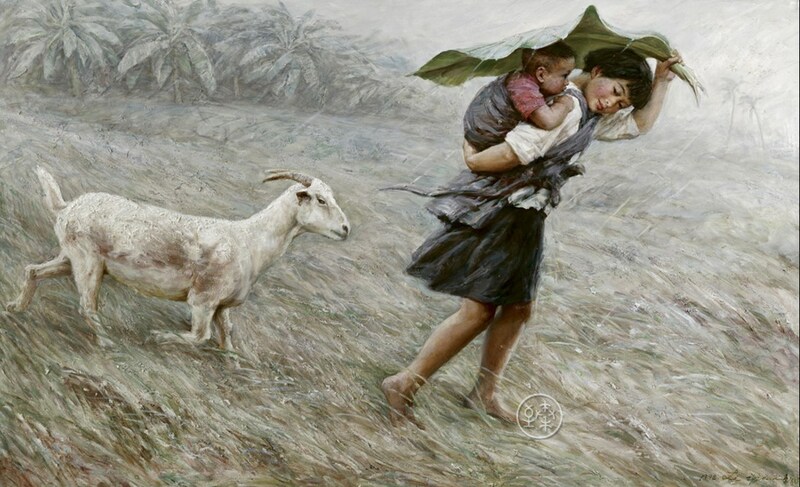 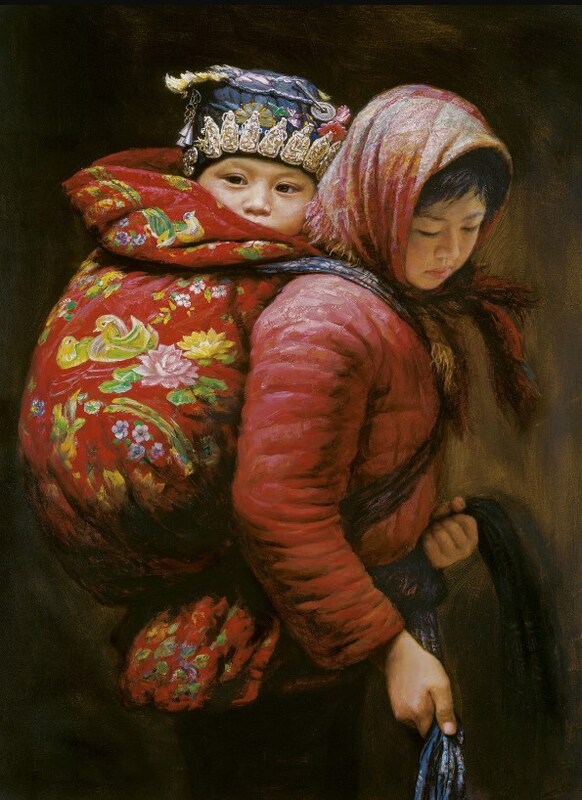 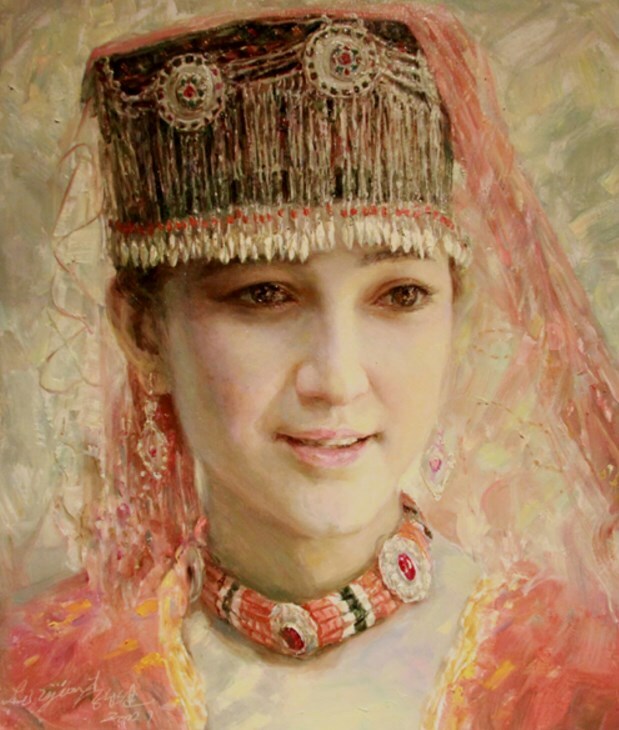 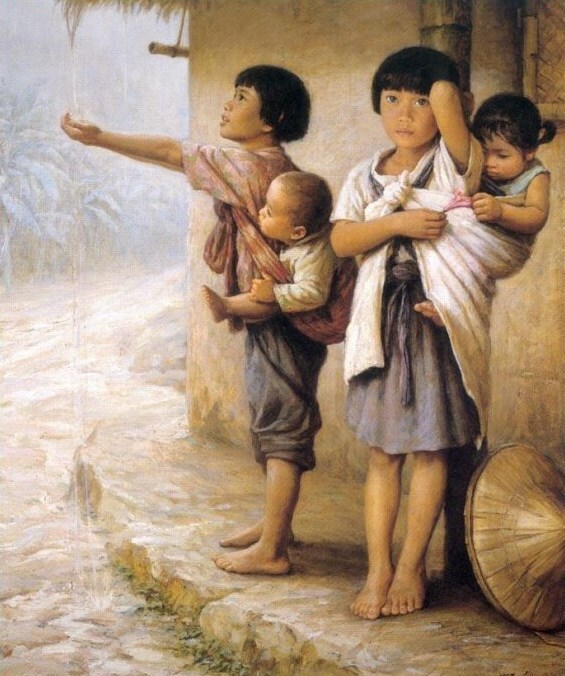 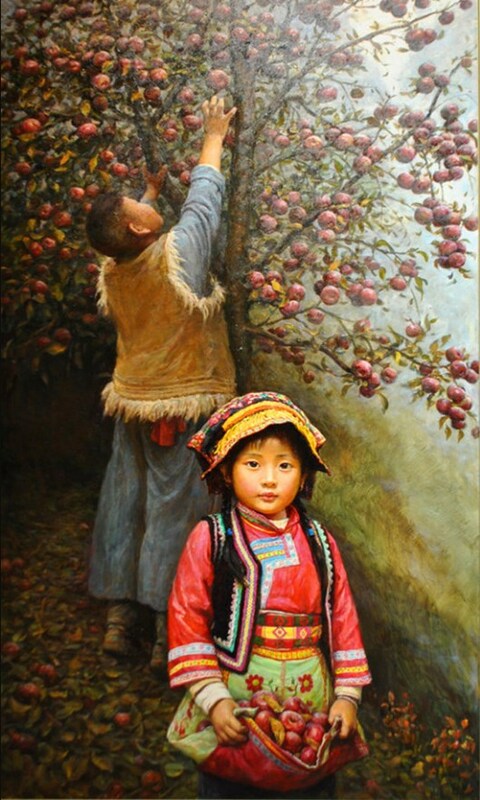 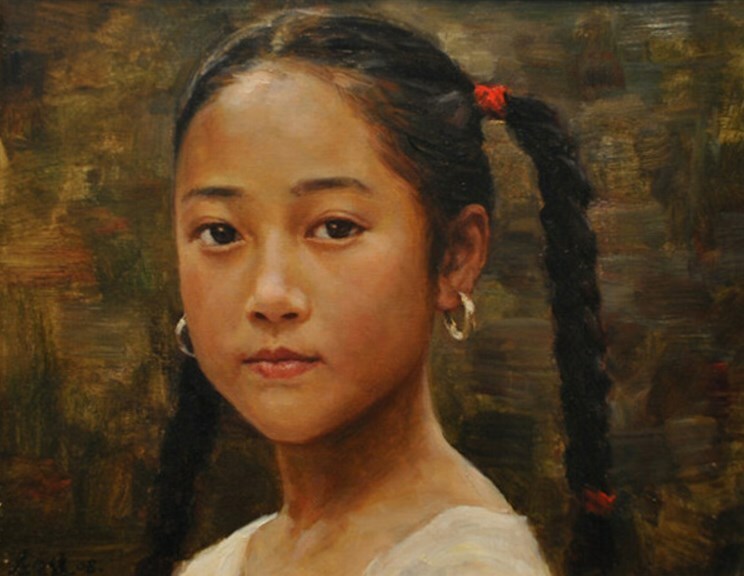 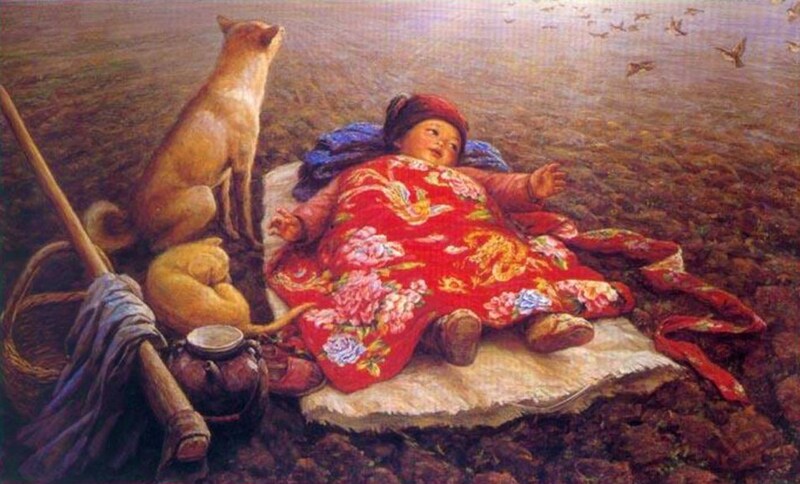 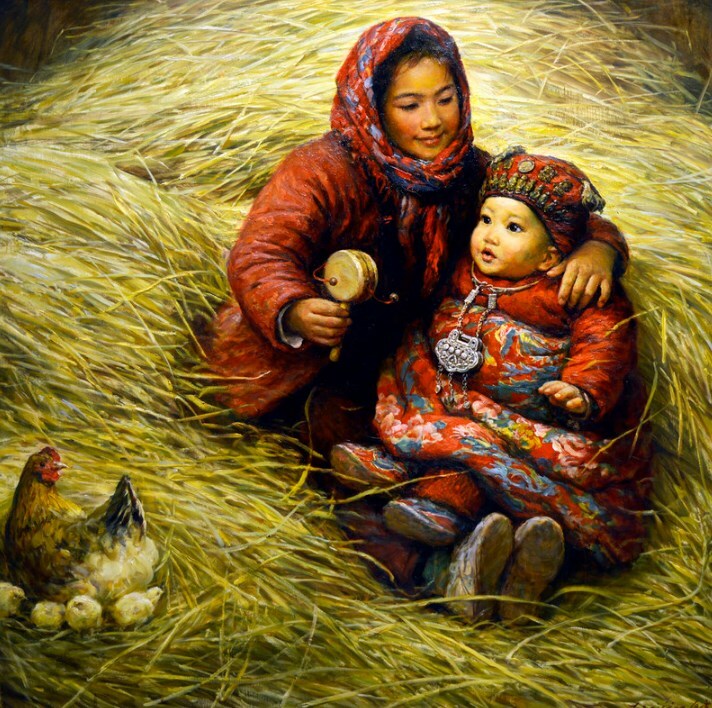 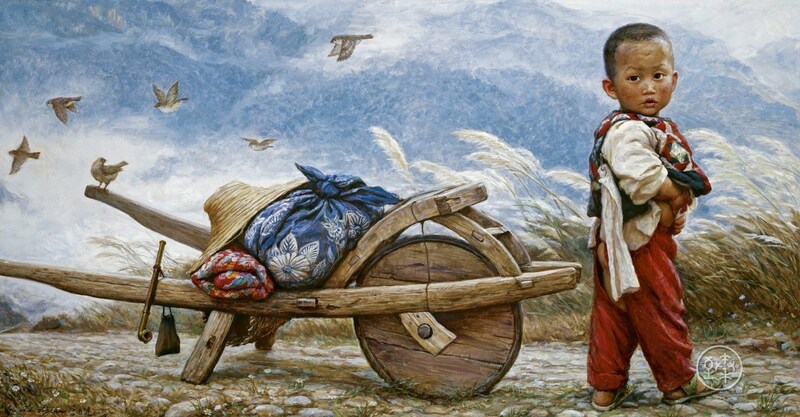 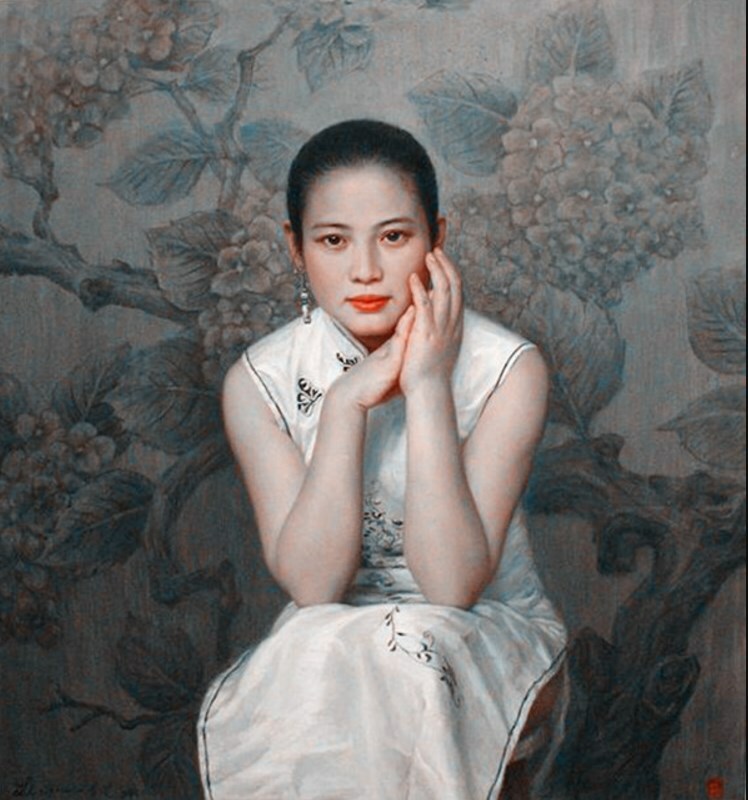 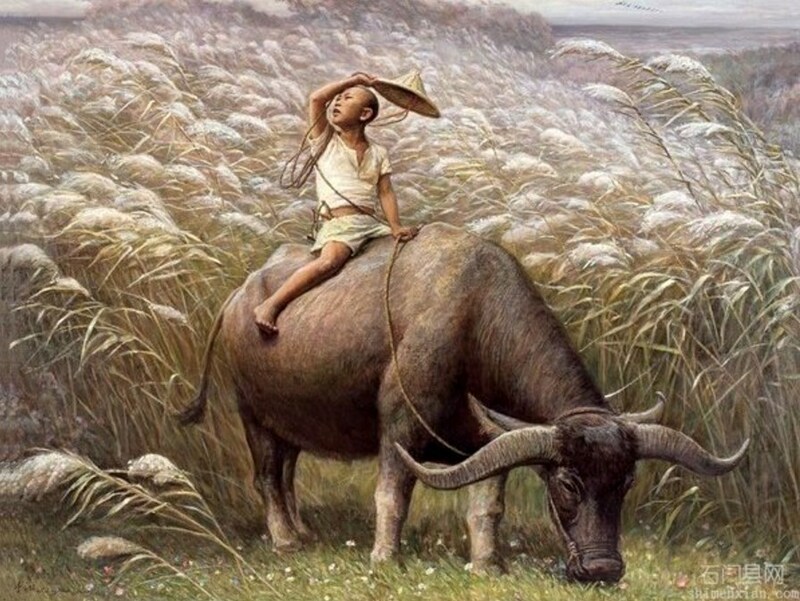 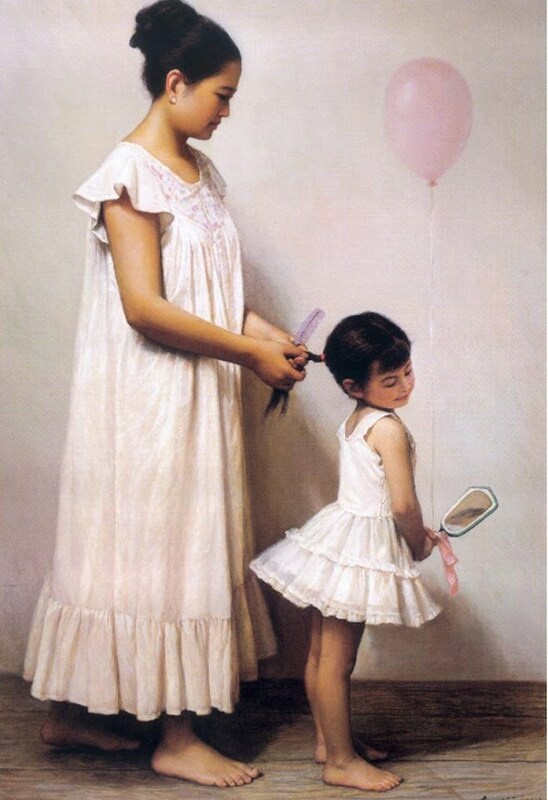 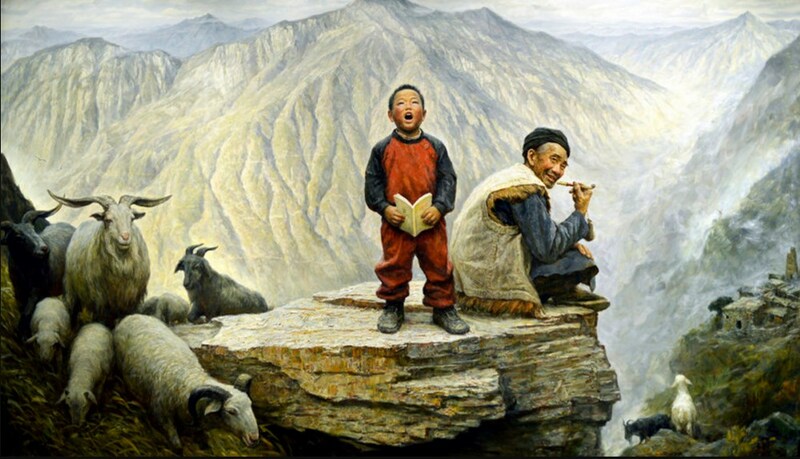 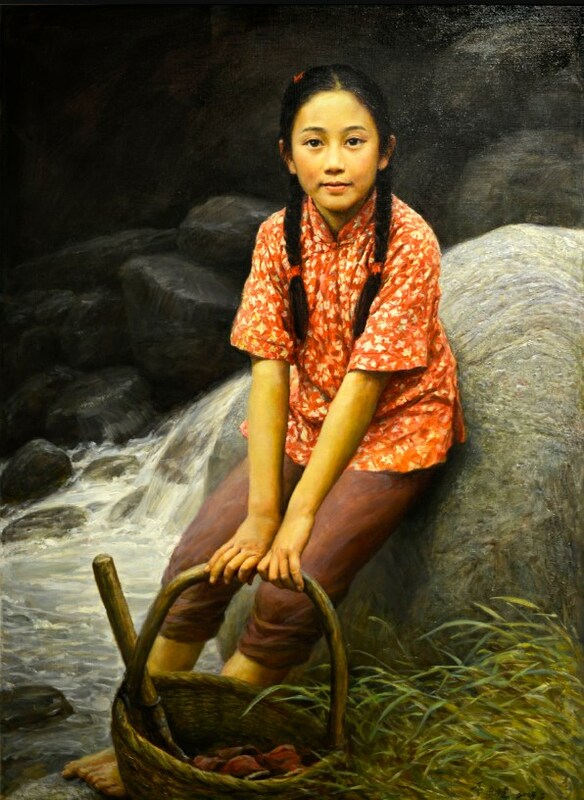 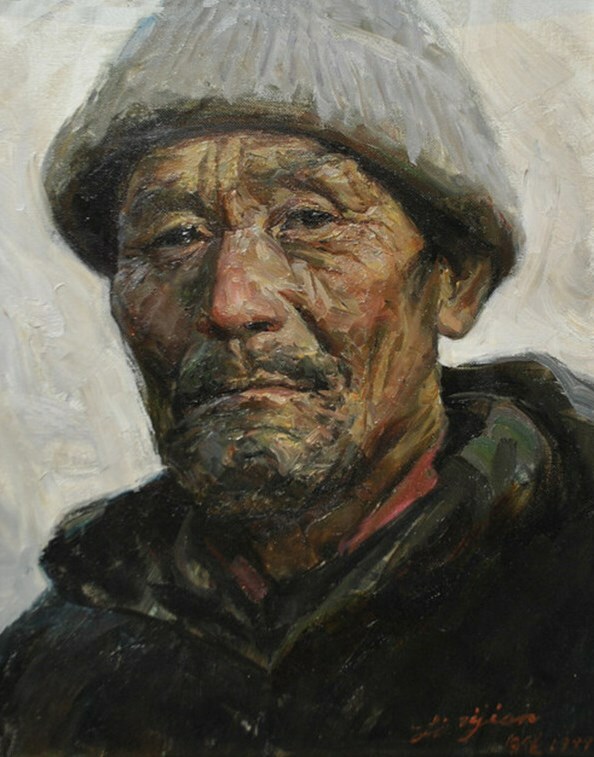 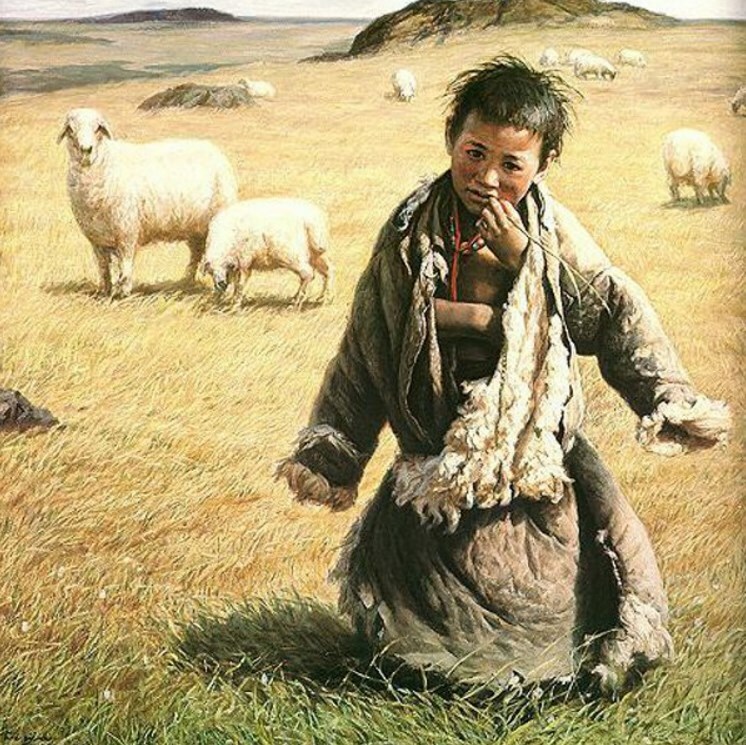 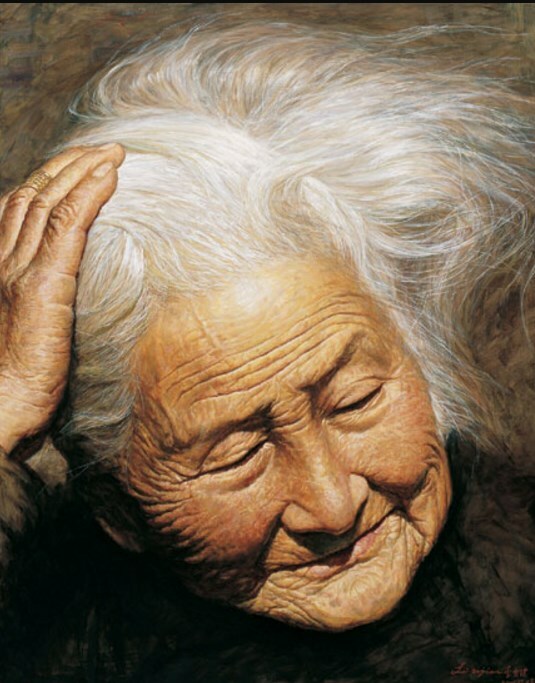 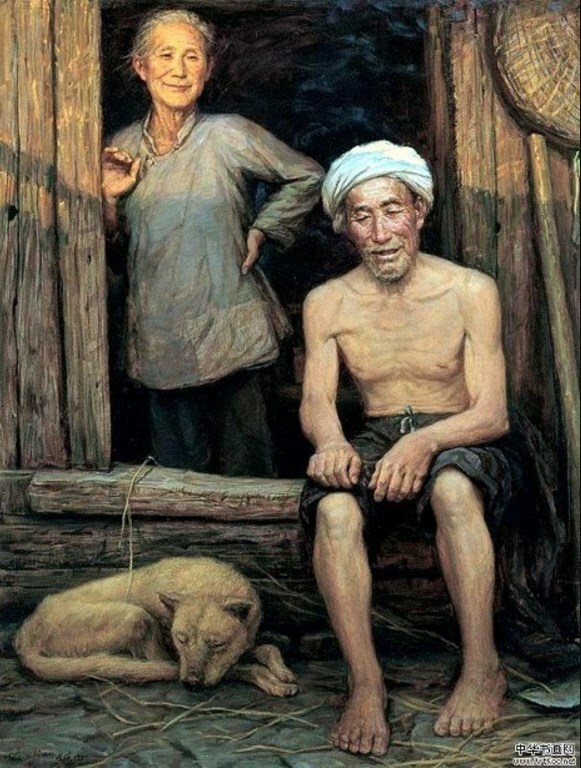 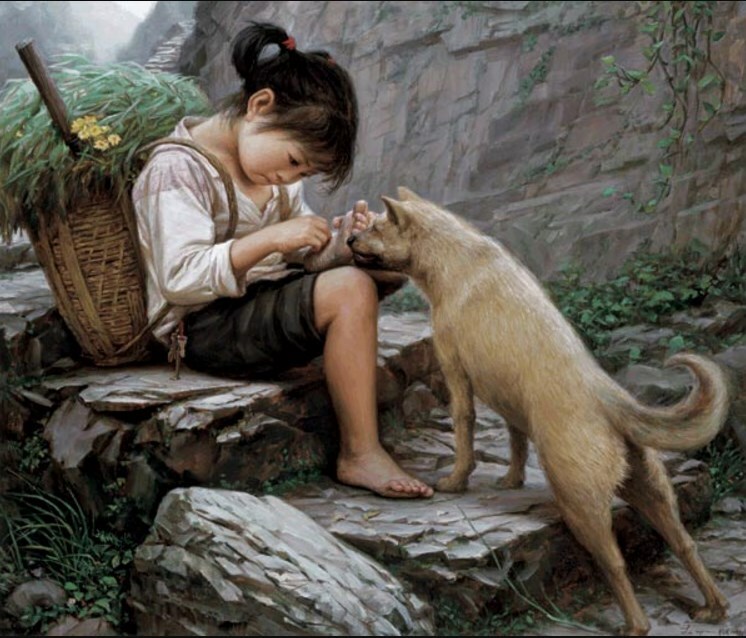 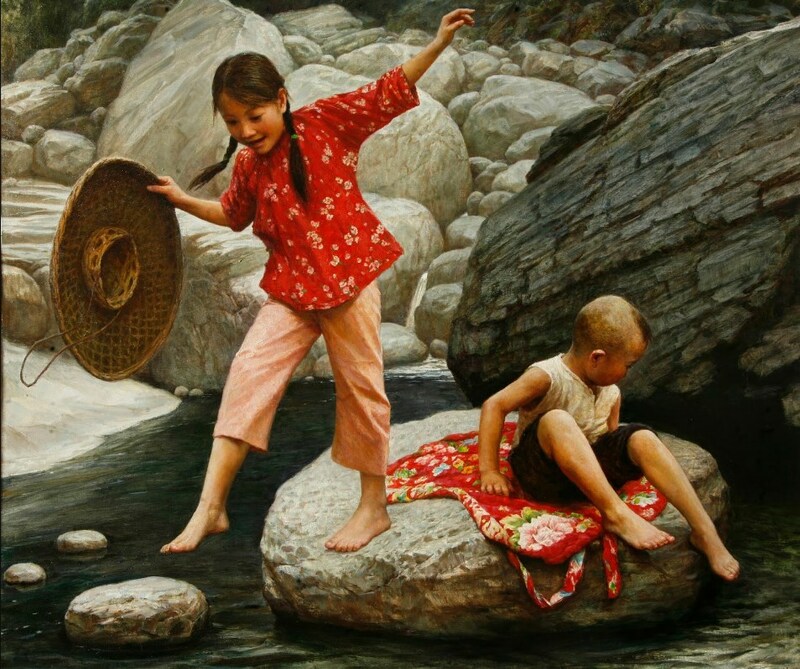 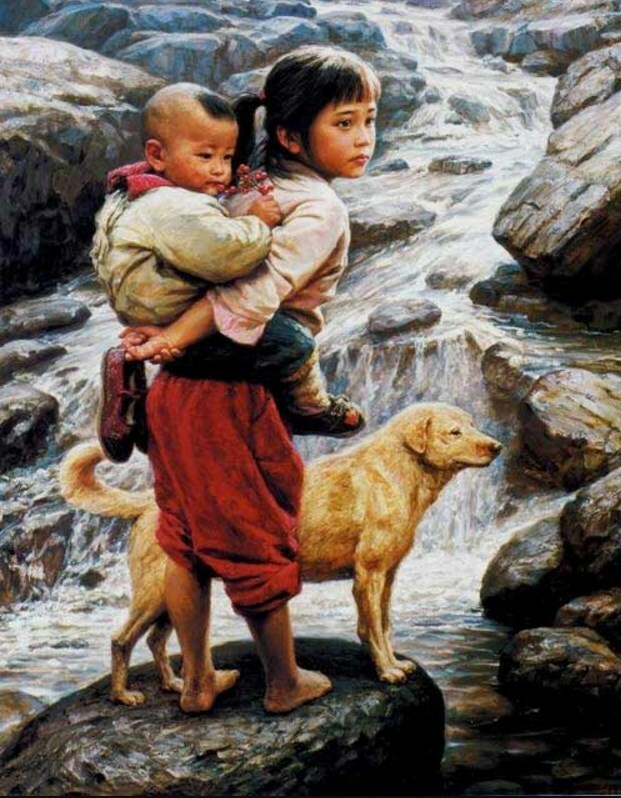 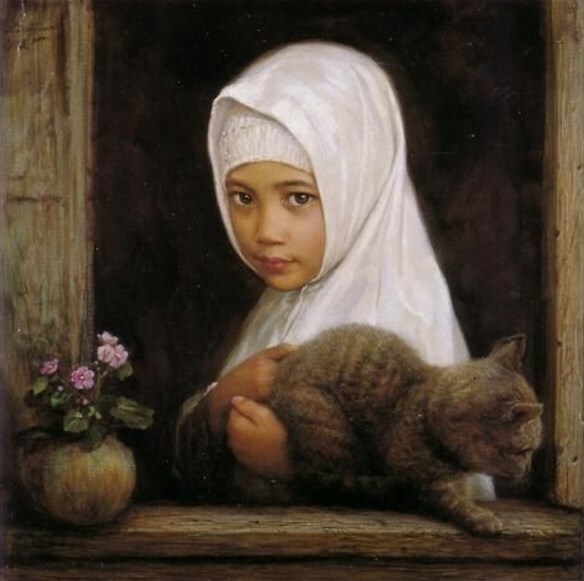 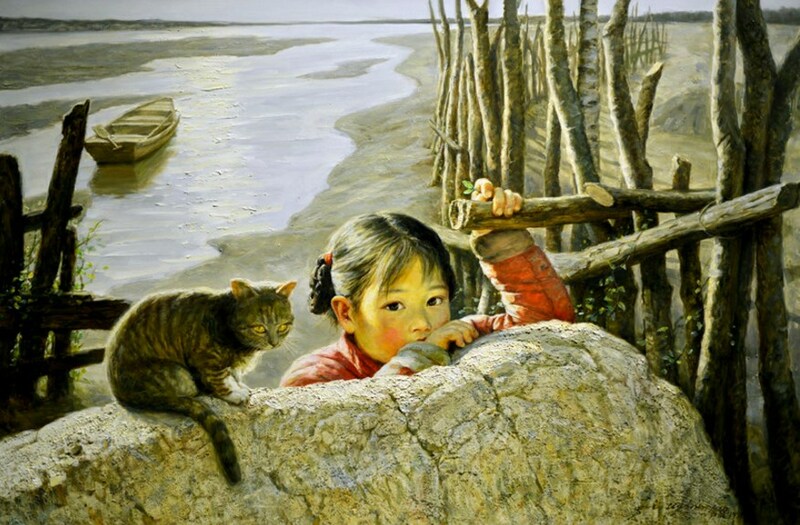 Born in the city of Shaoyang in Hunan Province in 1954, Li began to learn painting when he was 15. 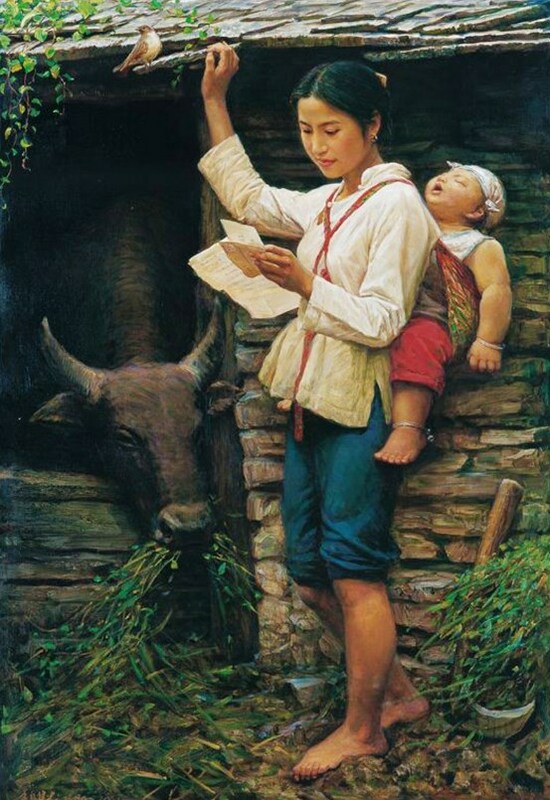 At that time, Li’s father was put into prison for political reasons. 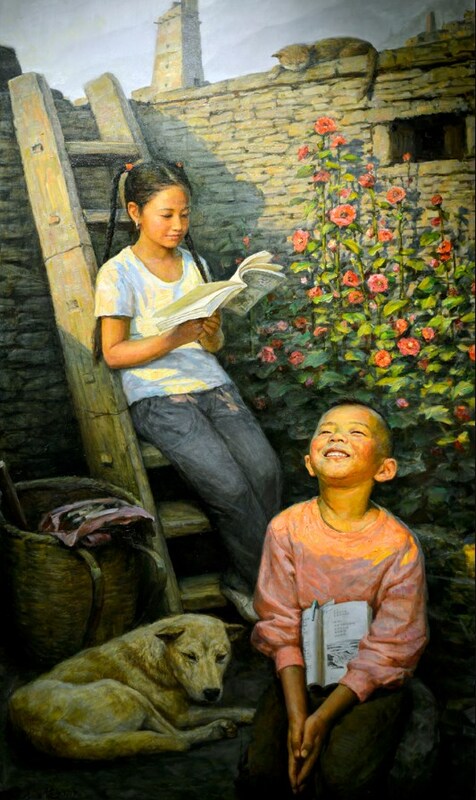 Li never gave up his passion for art even though sometimes he had to earn money to help his mother support the family. 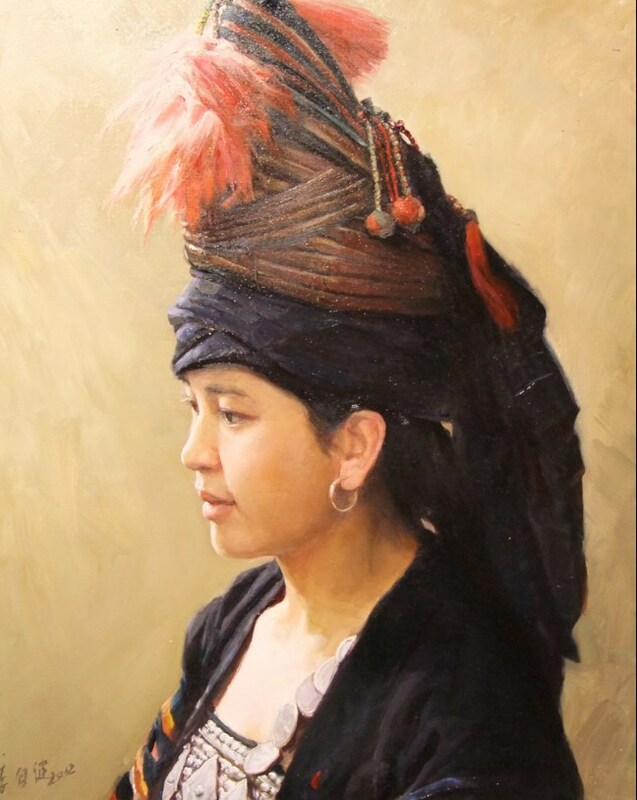 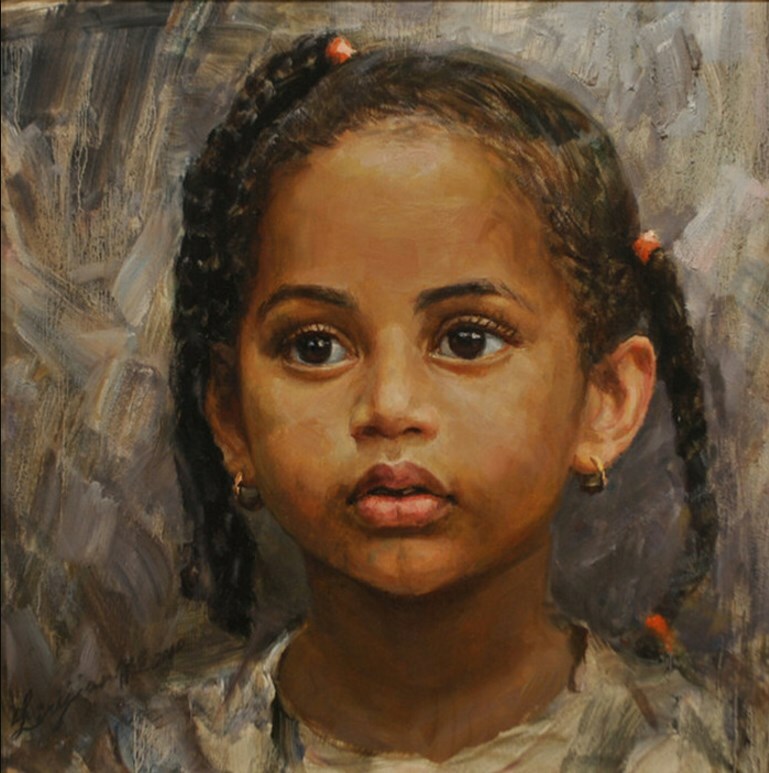 He graduated from the Oil Painting Department of the Guangzhou Academy of Fine Arts in 1982 and moved to Los Angeles in 1988. 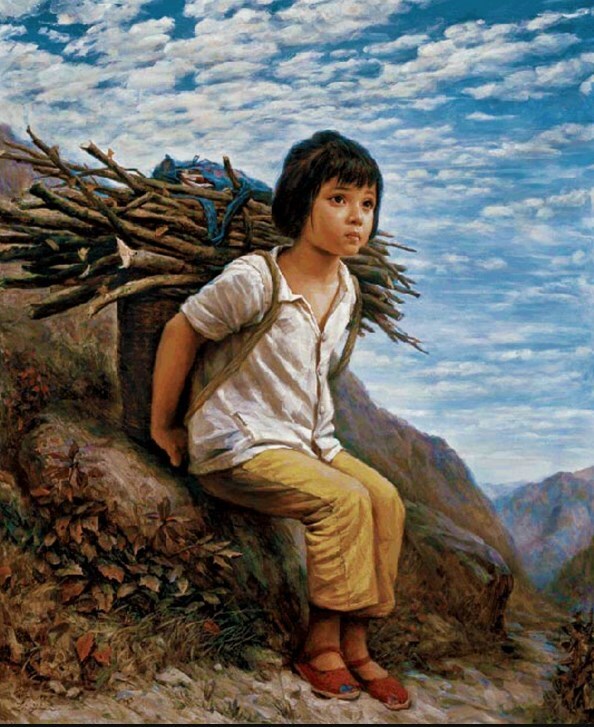 When Li first began his life in Los Angeles, everything was far from what he had expected — he had to learn English and make a living first. 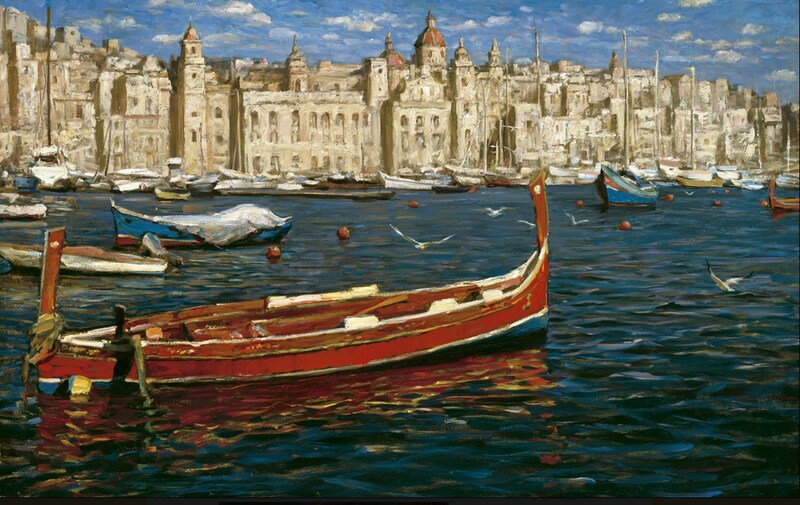 For quite a long time, he had to paint for money instead of creating the works he wanted. 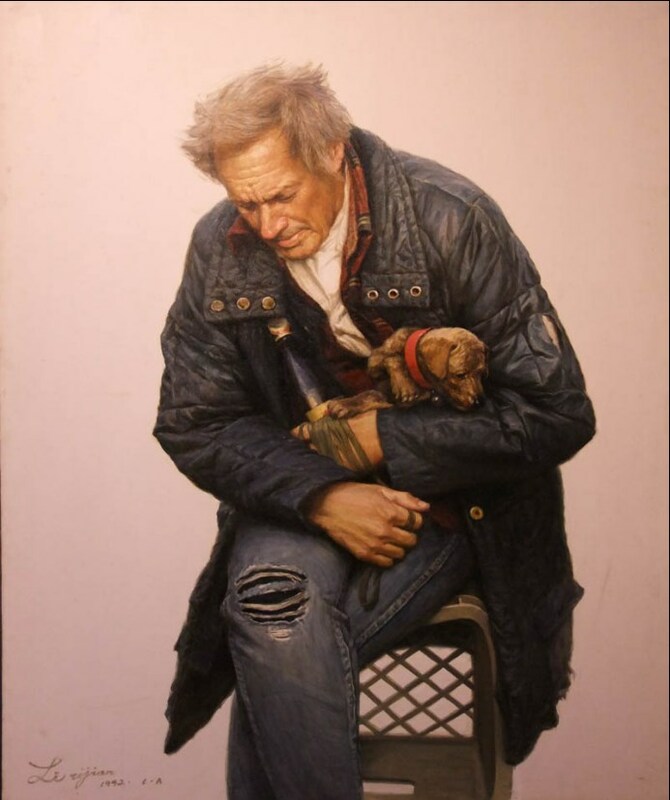 Although life was hard, this strong-willed man never lost heart. 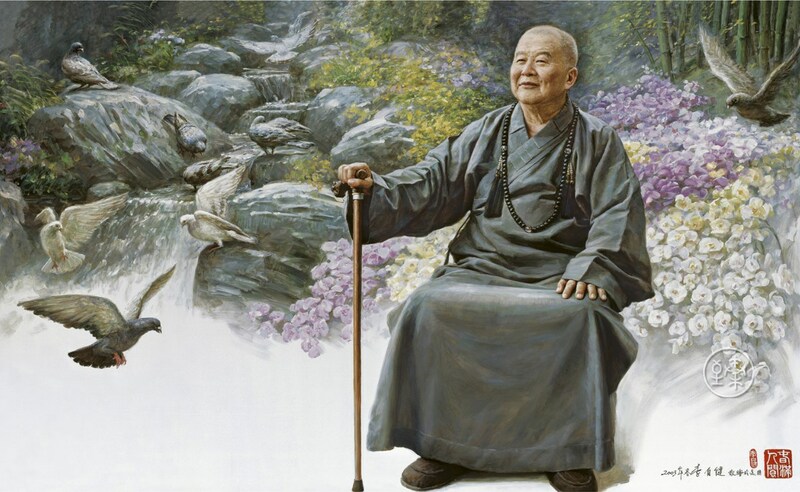 In 1991, he met Master Xing Yun, a Buddhist monk. 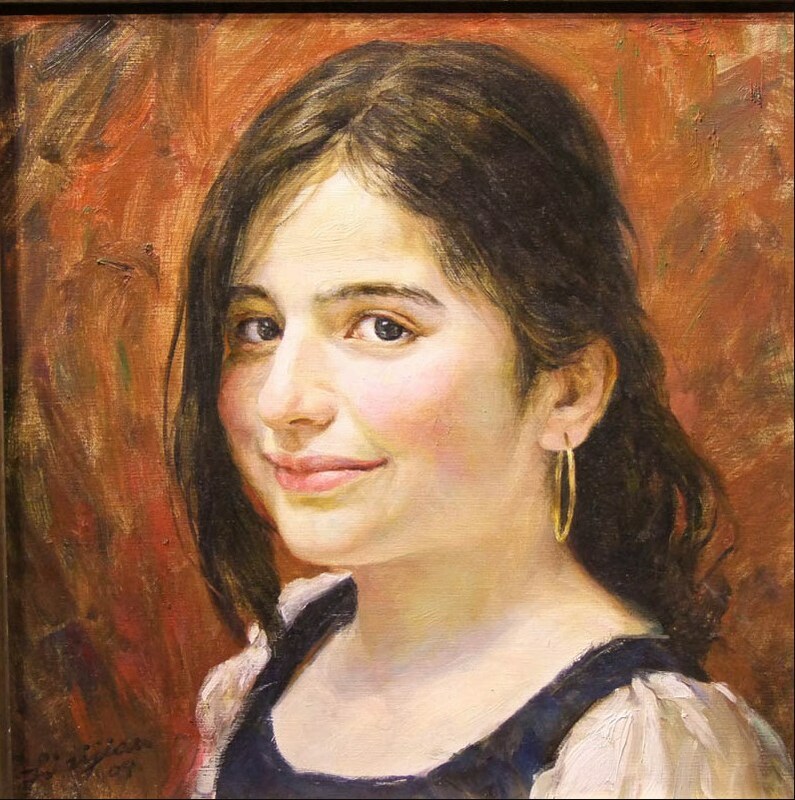 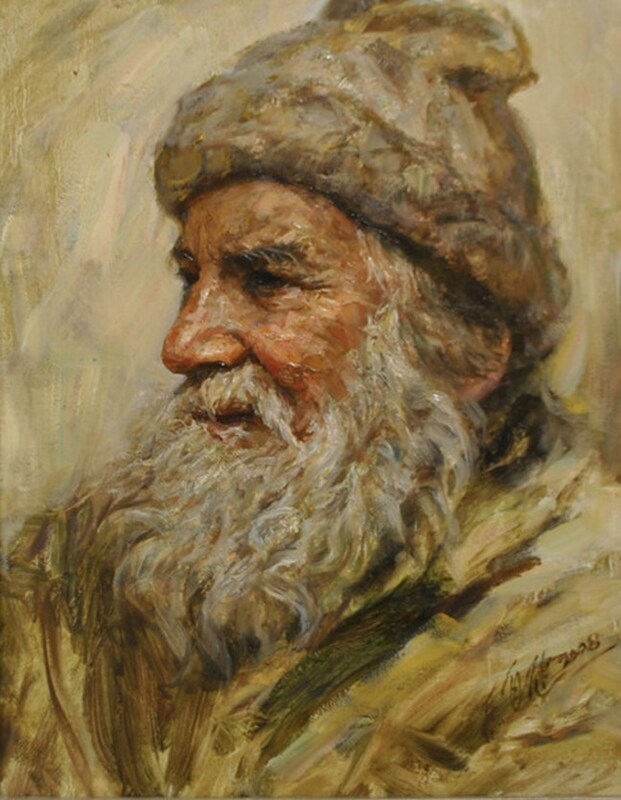 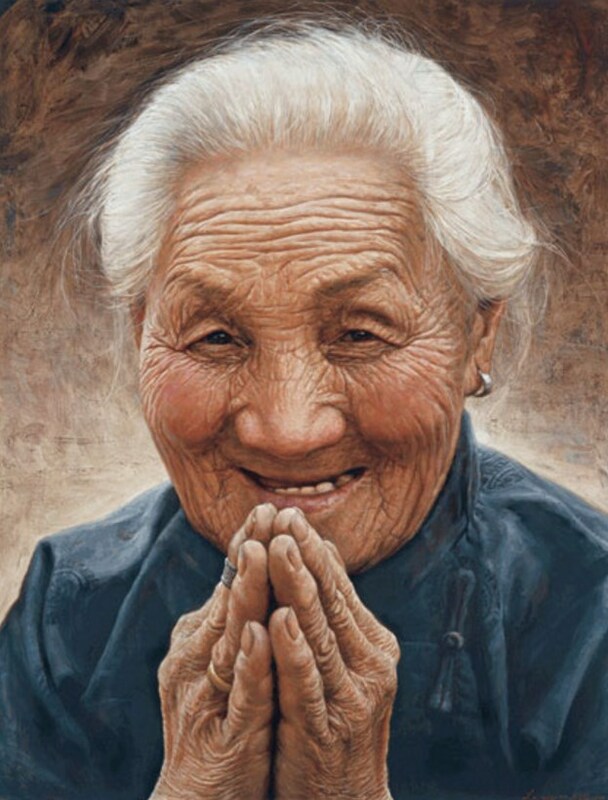 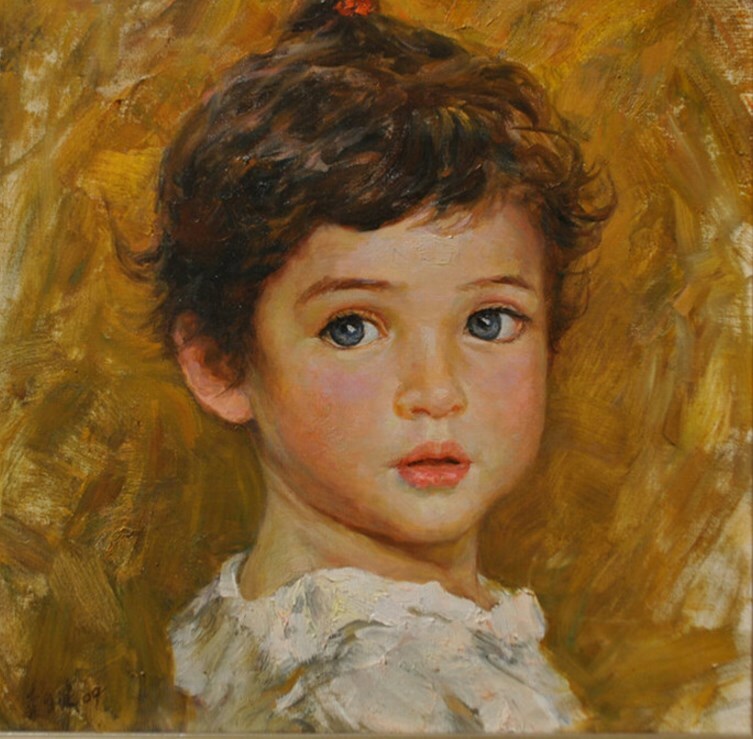 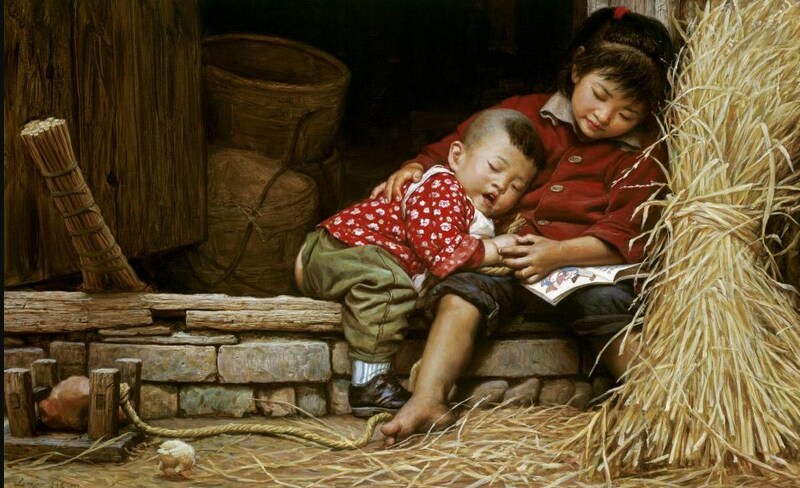 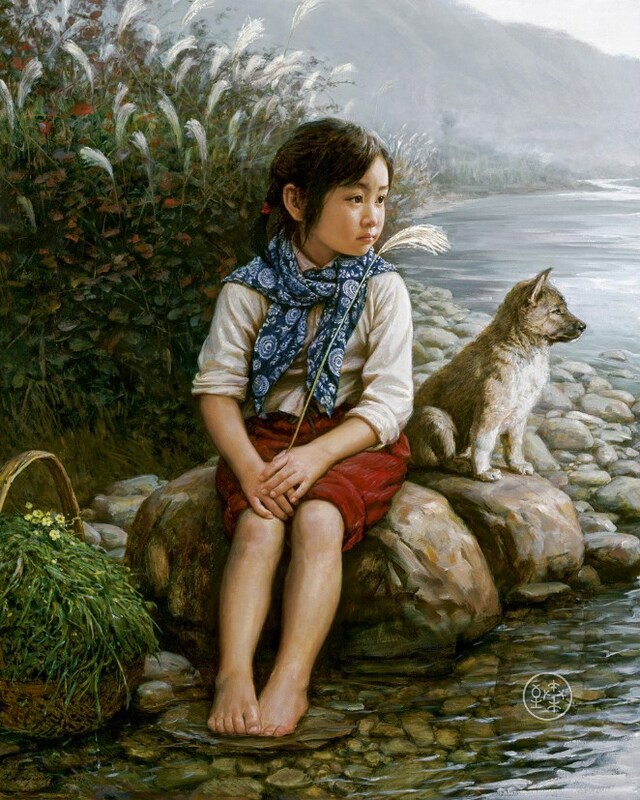 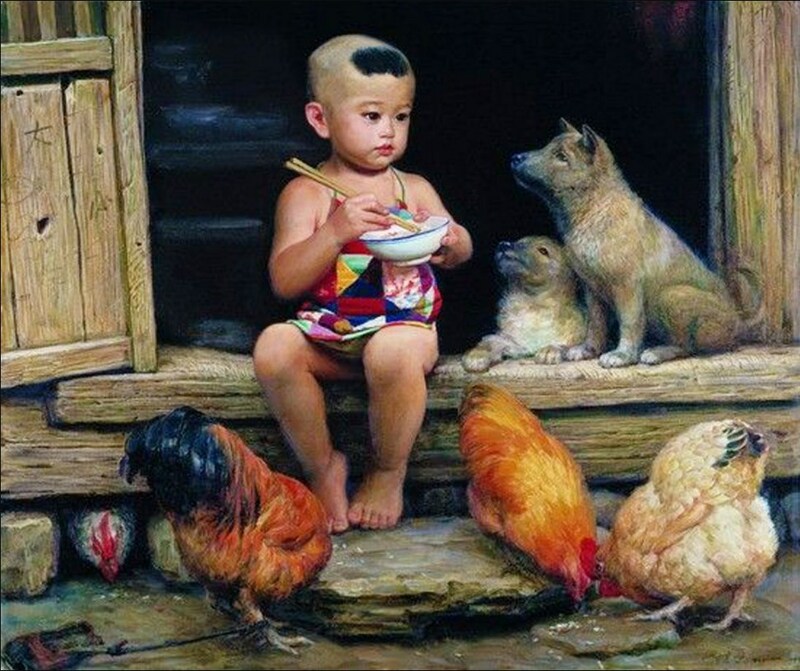 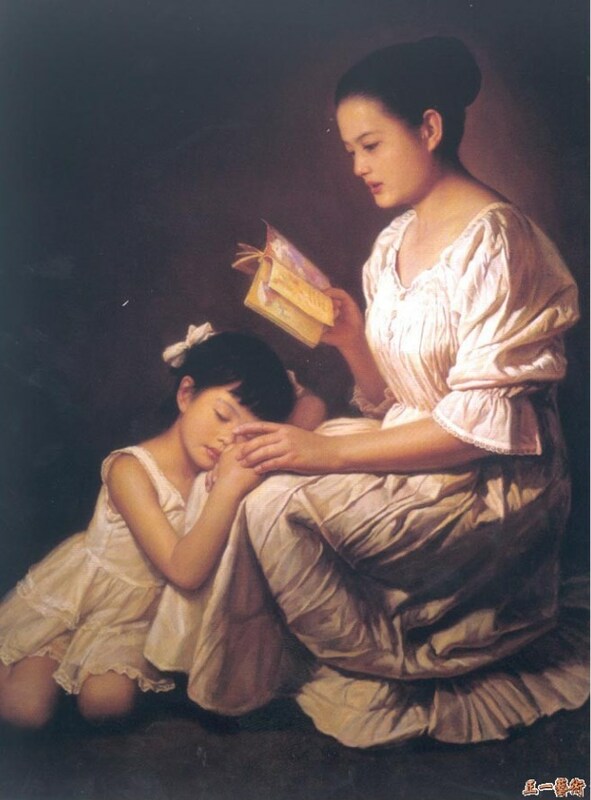 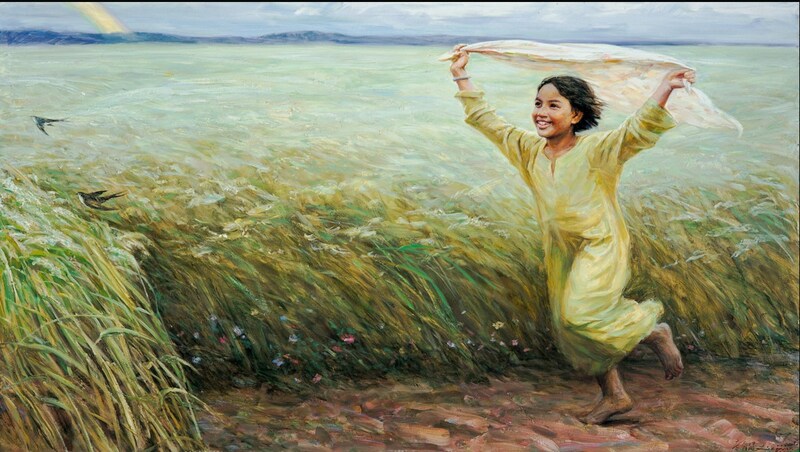 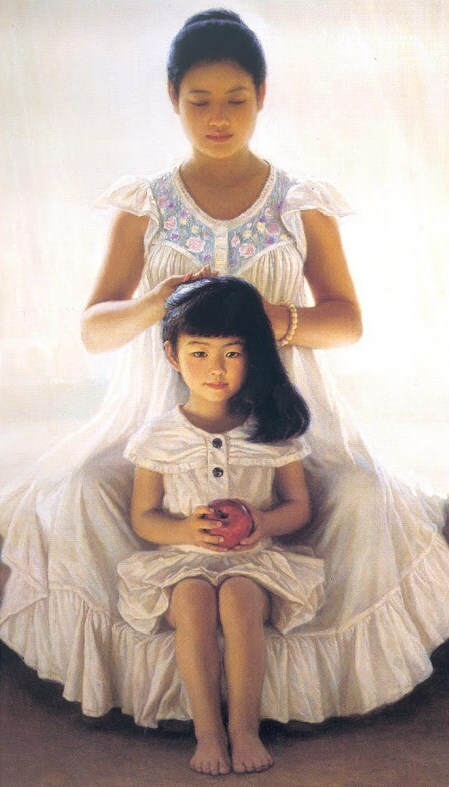 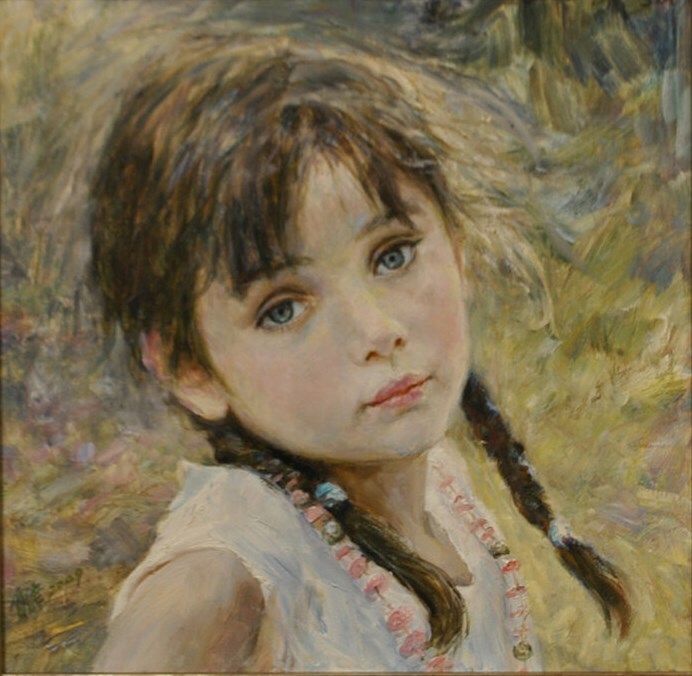 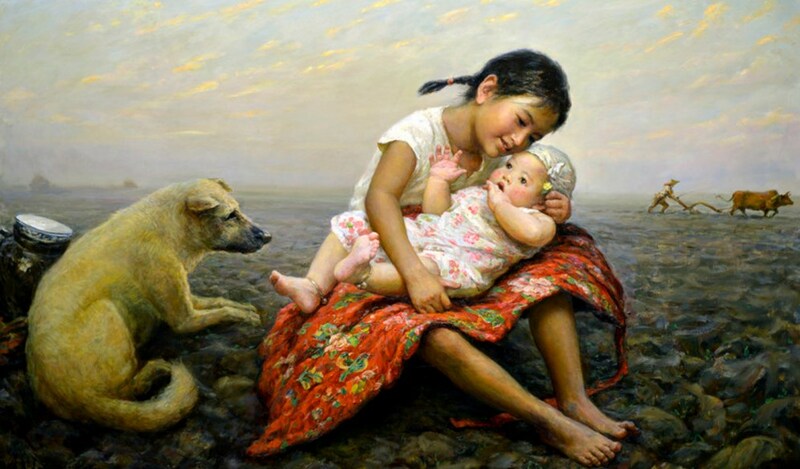 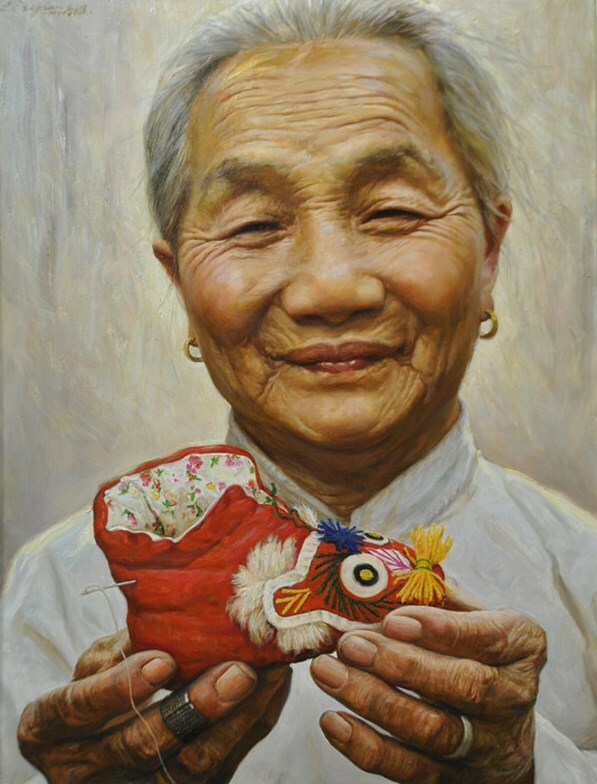 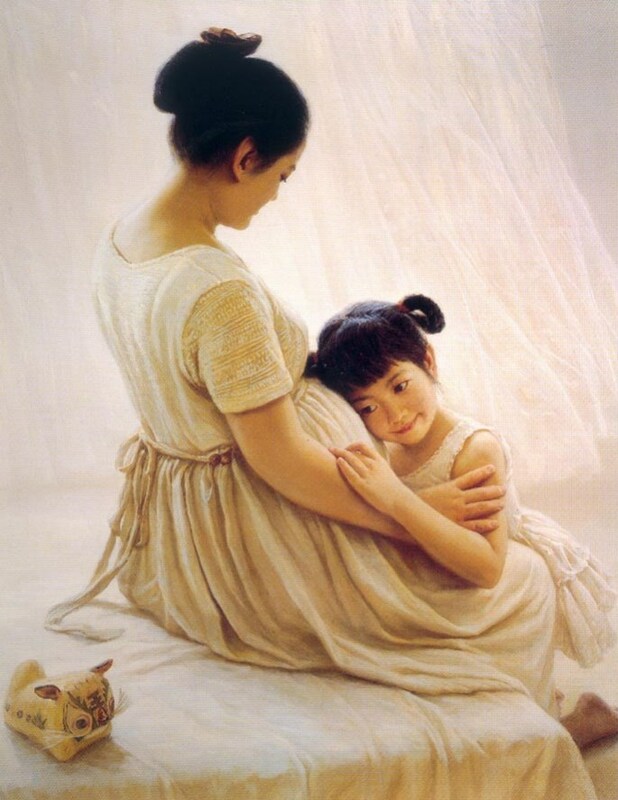 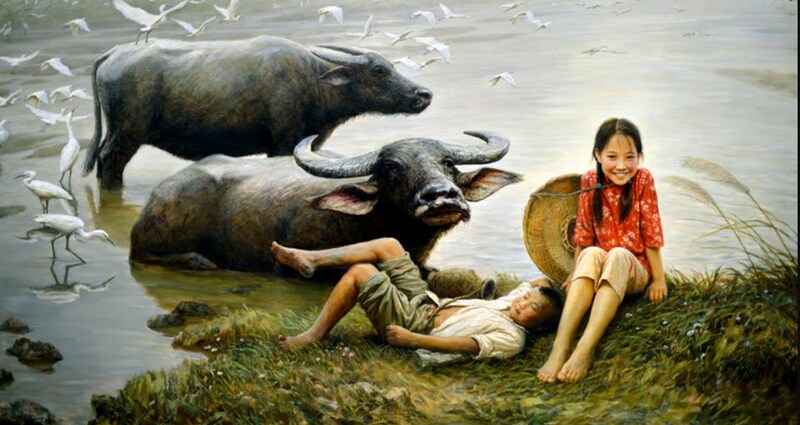 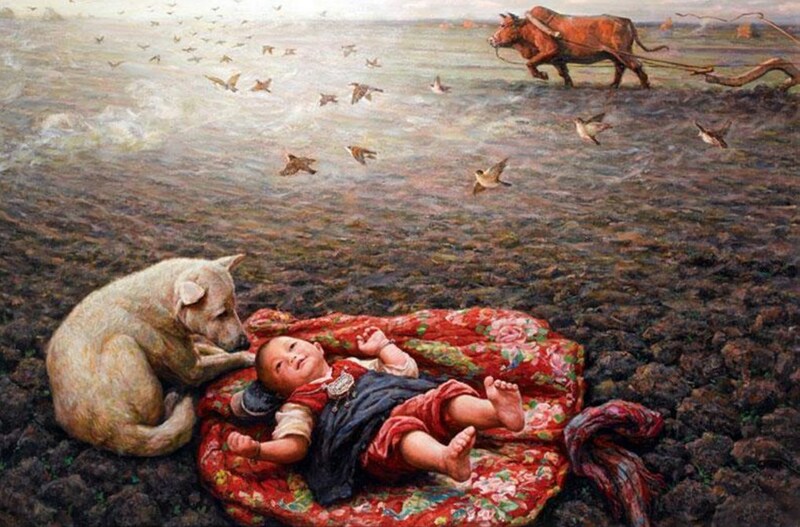 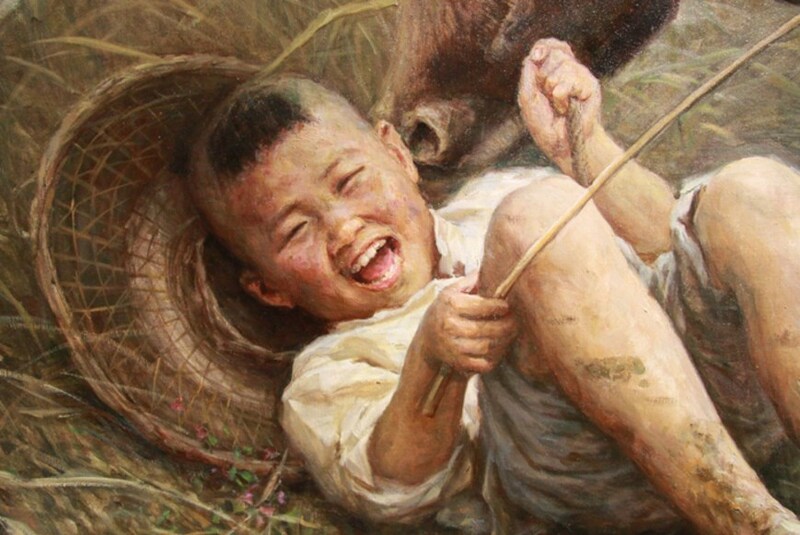 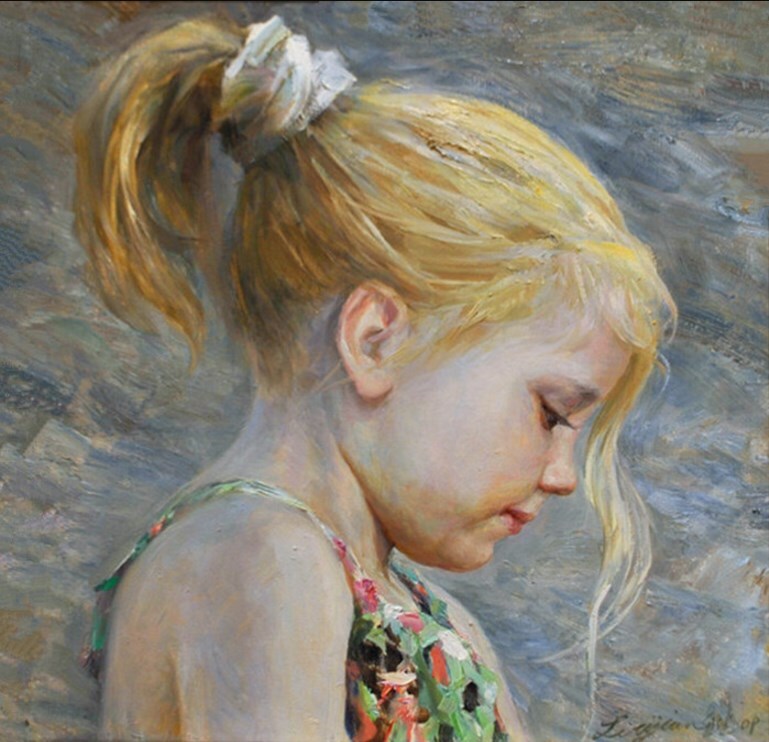 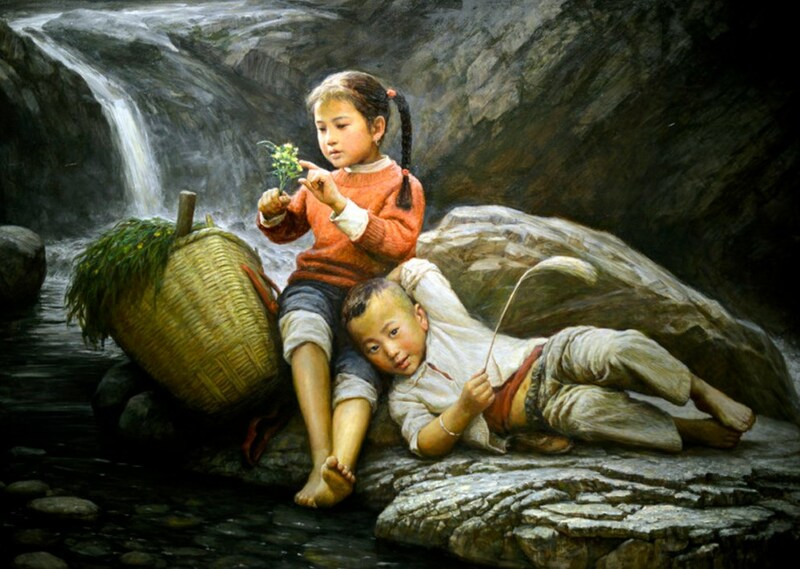 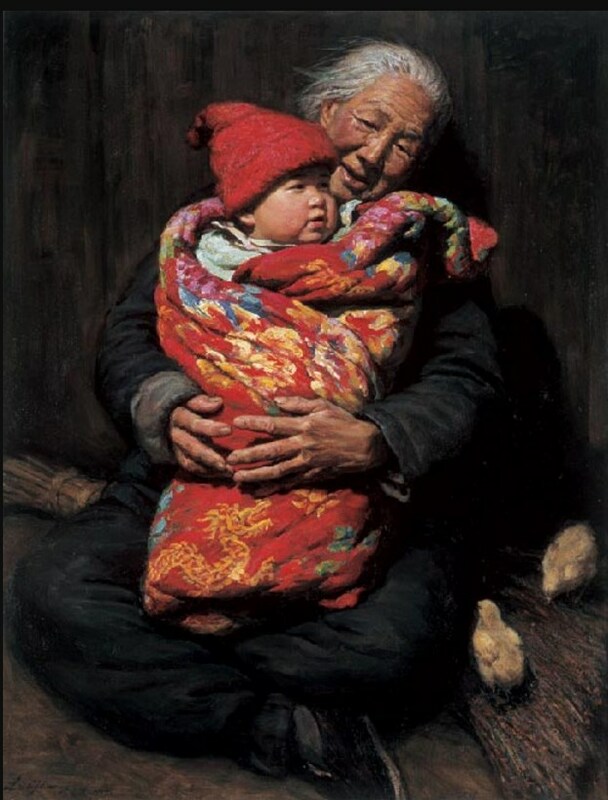 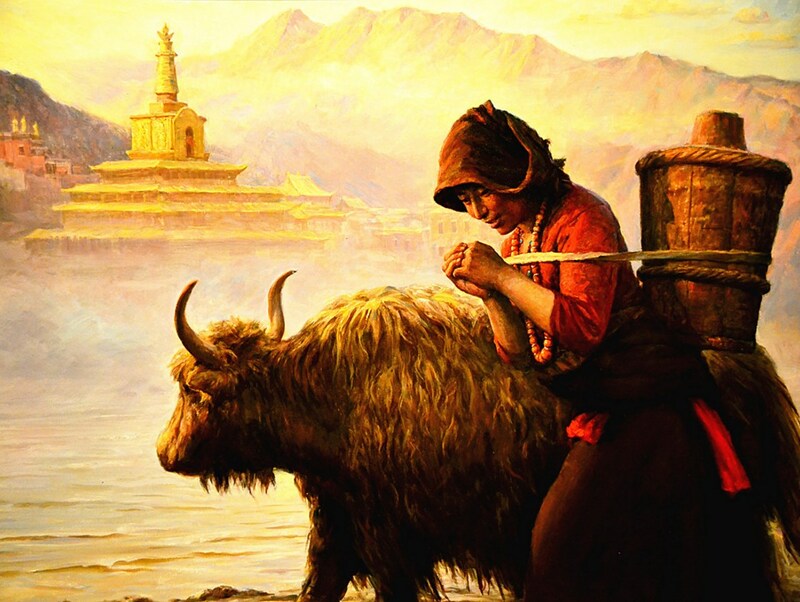 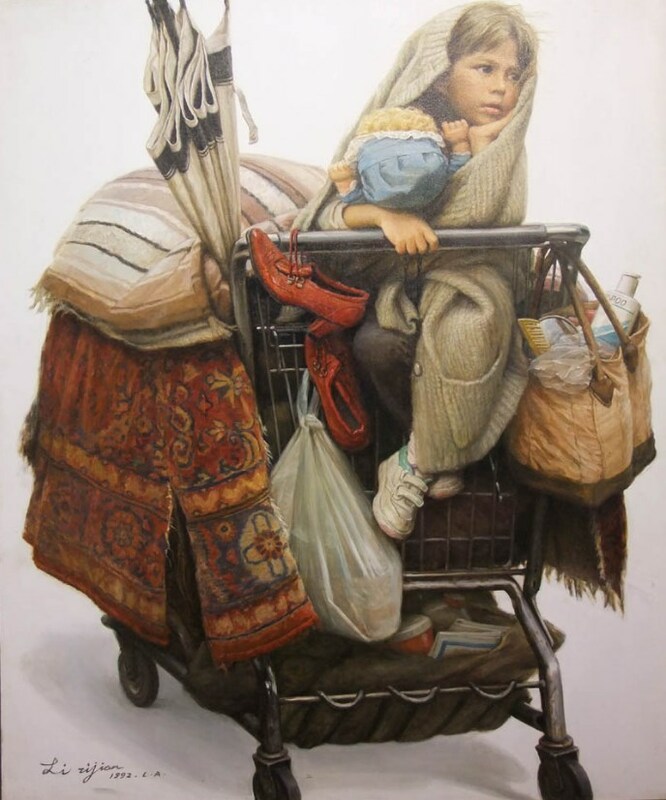 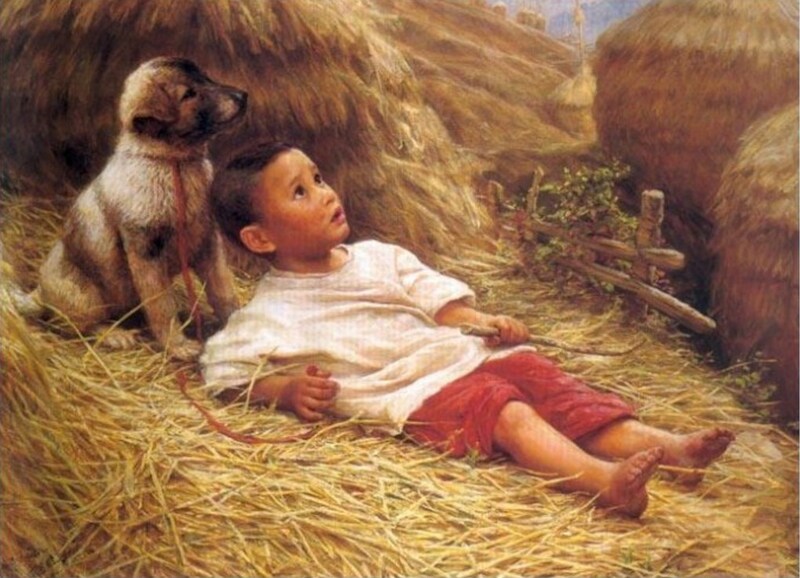 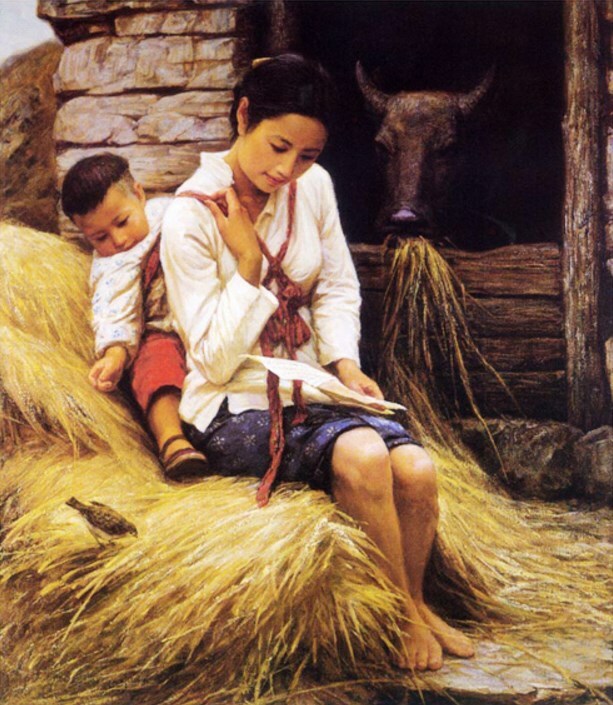 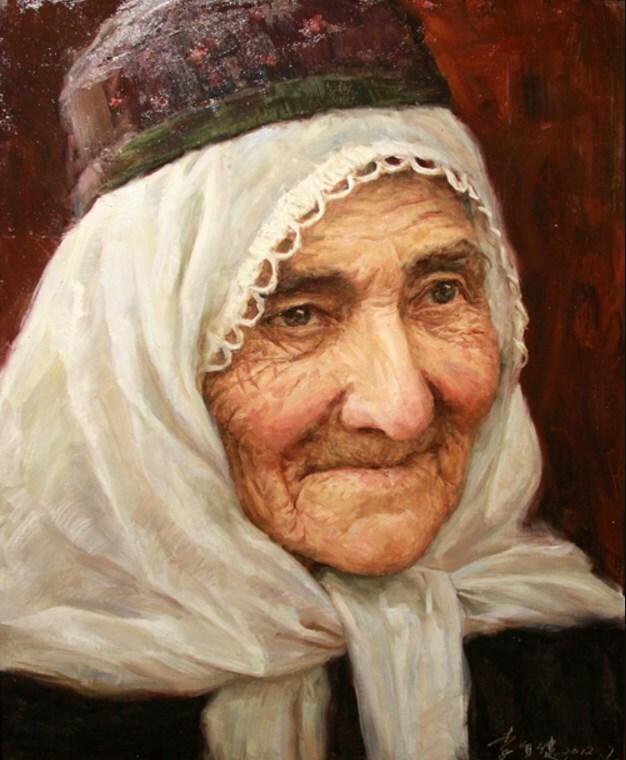 With the financial and spiritual support of the master, Li plumbed the depths of his mind to create a great series of oil paintings in realistic style, filled with humanity and love. 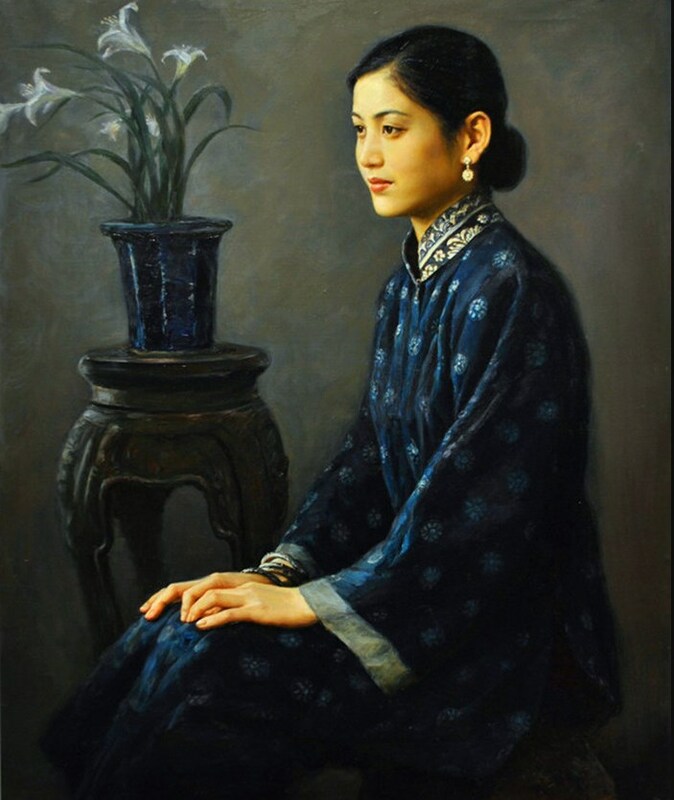 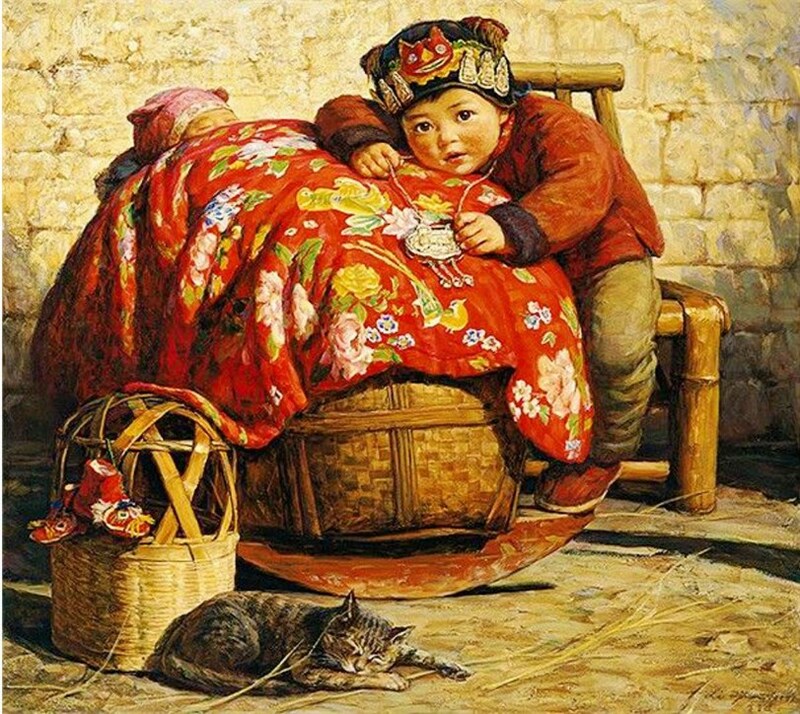 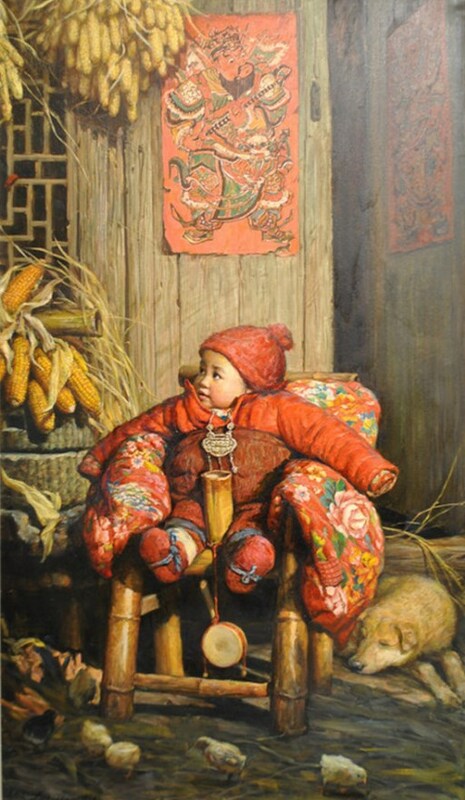 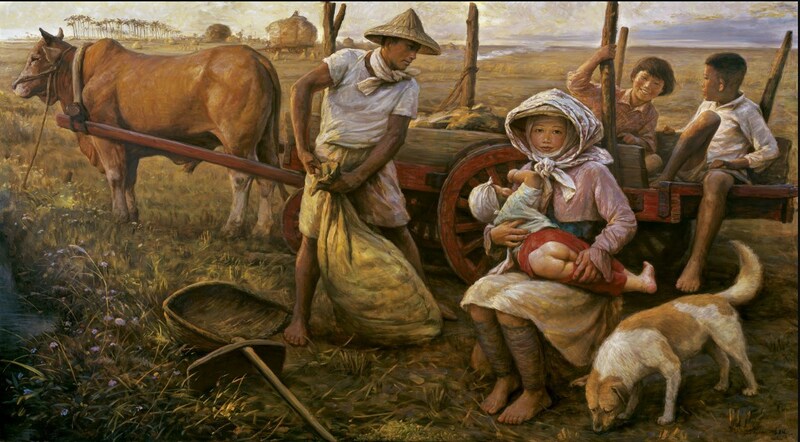 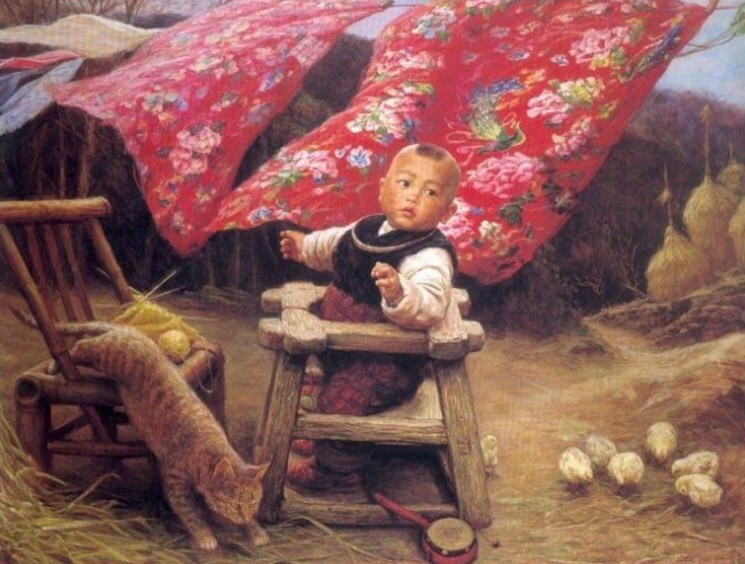 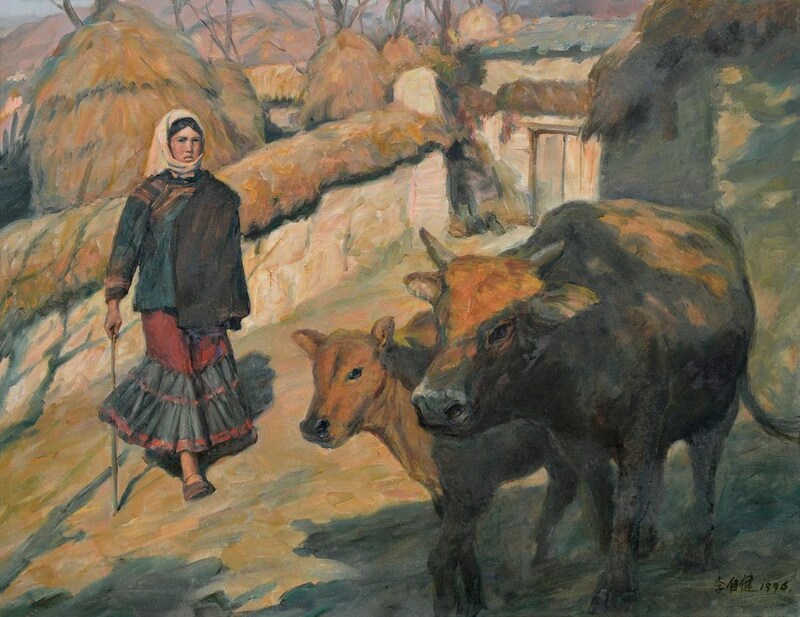 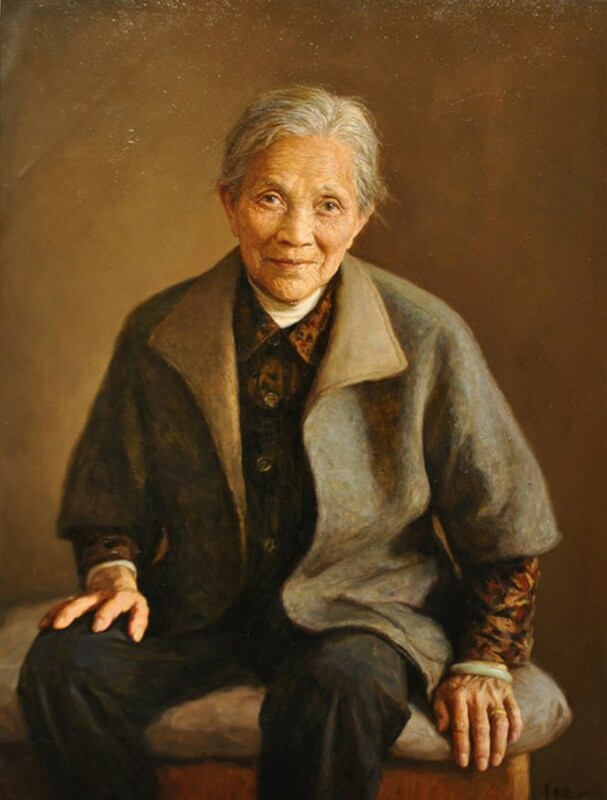 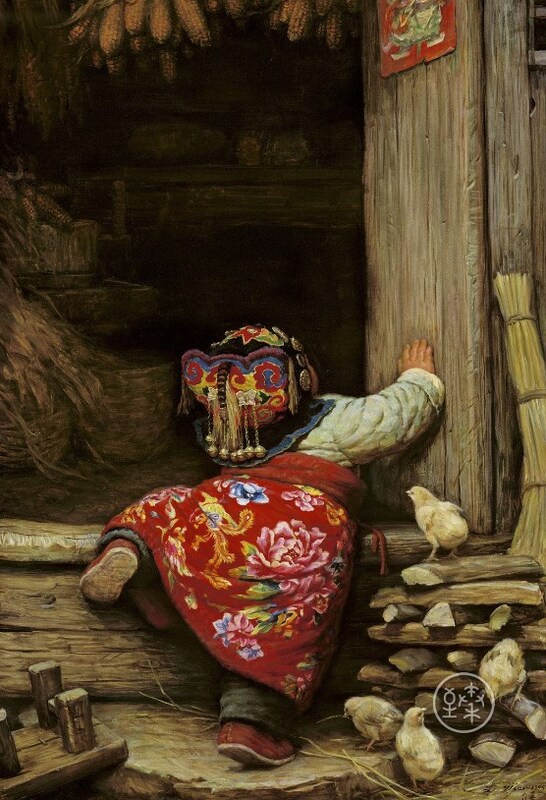 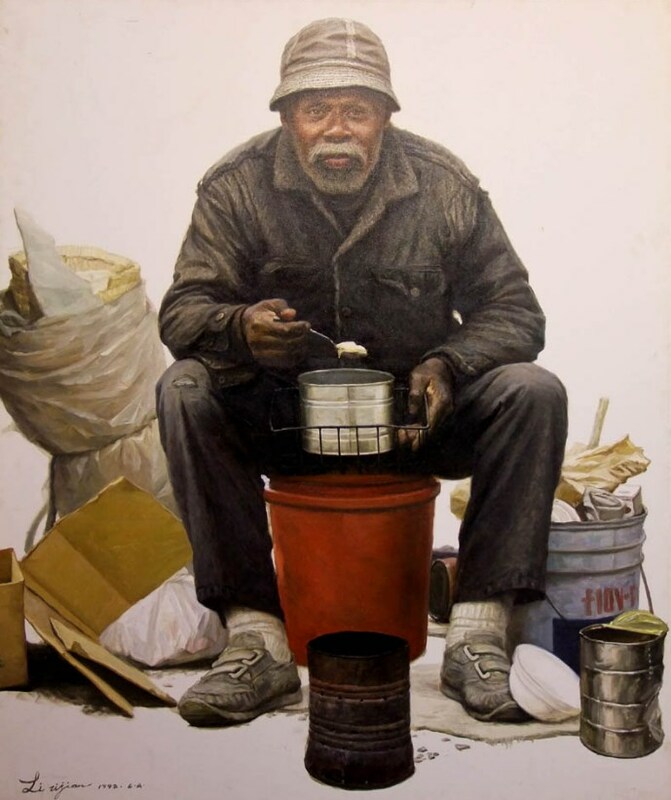 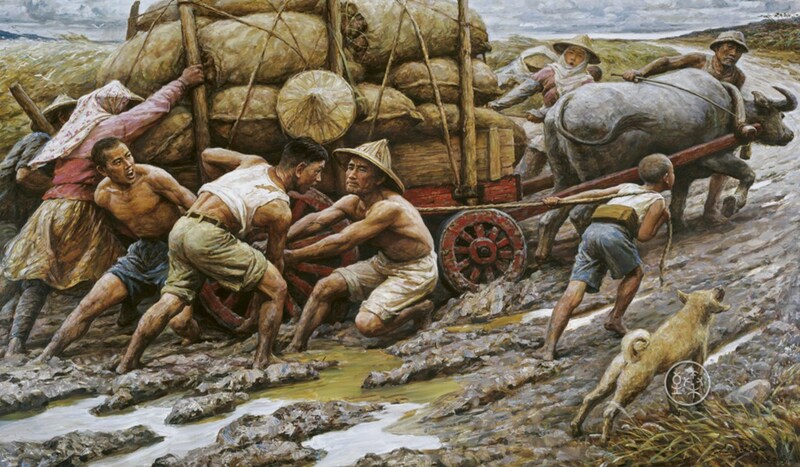 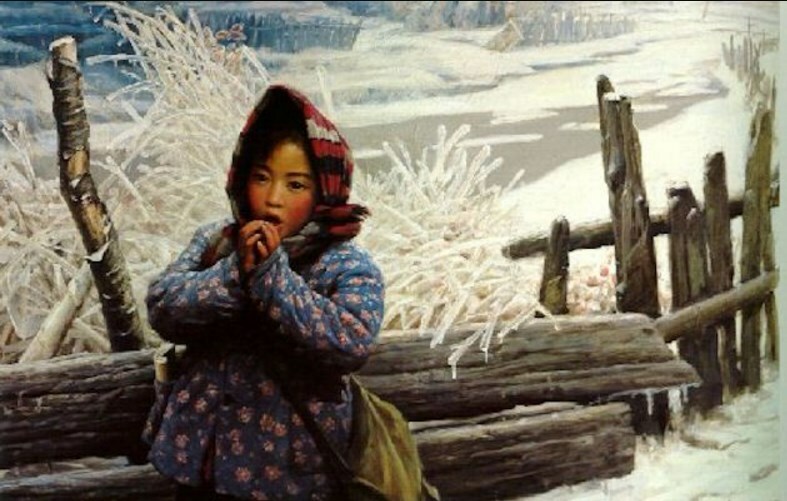 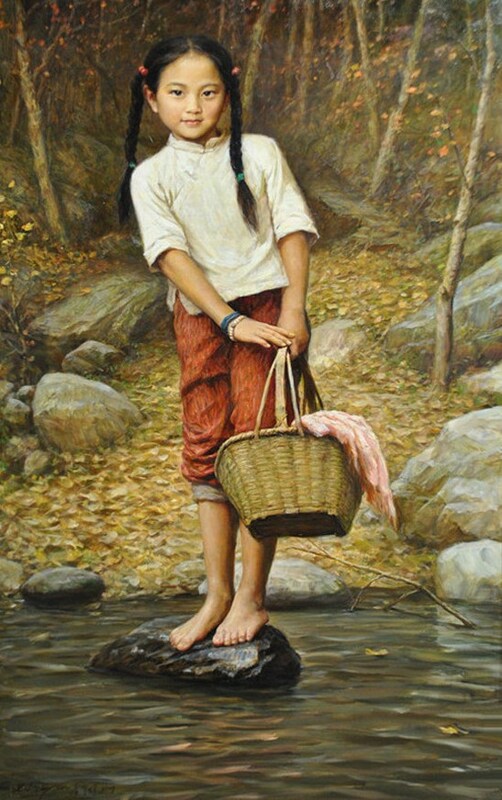 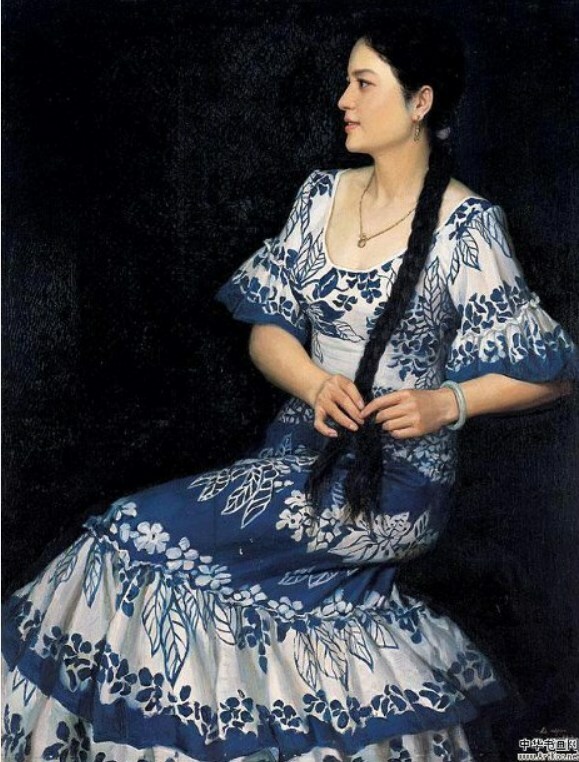 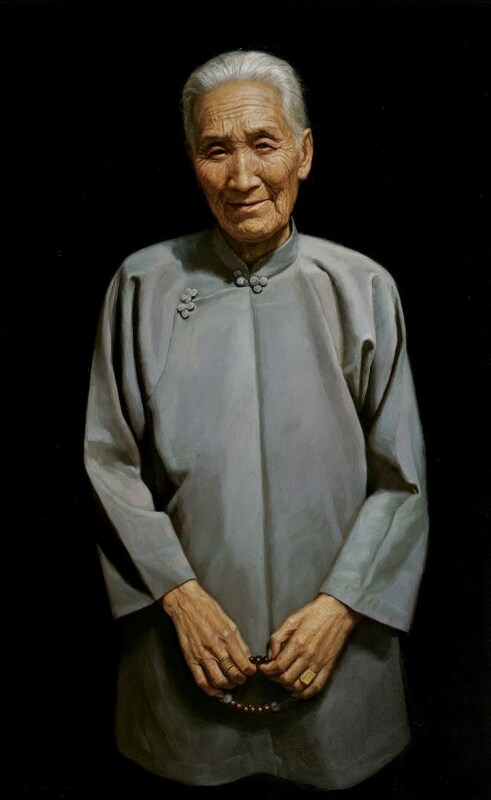 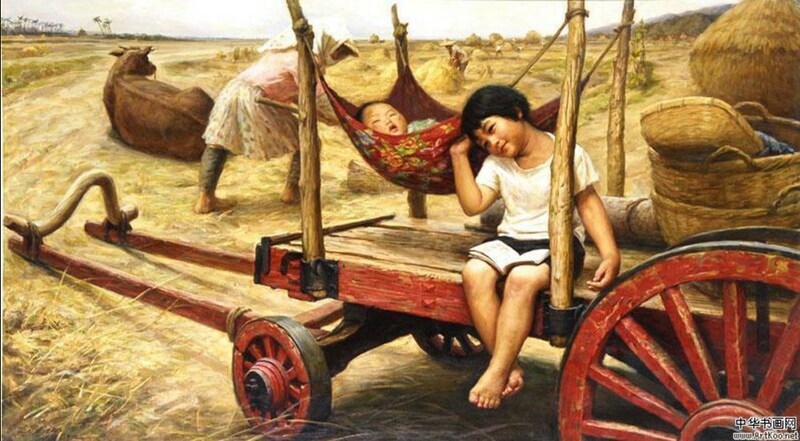 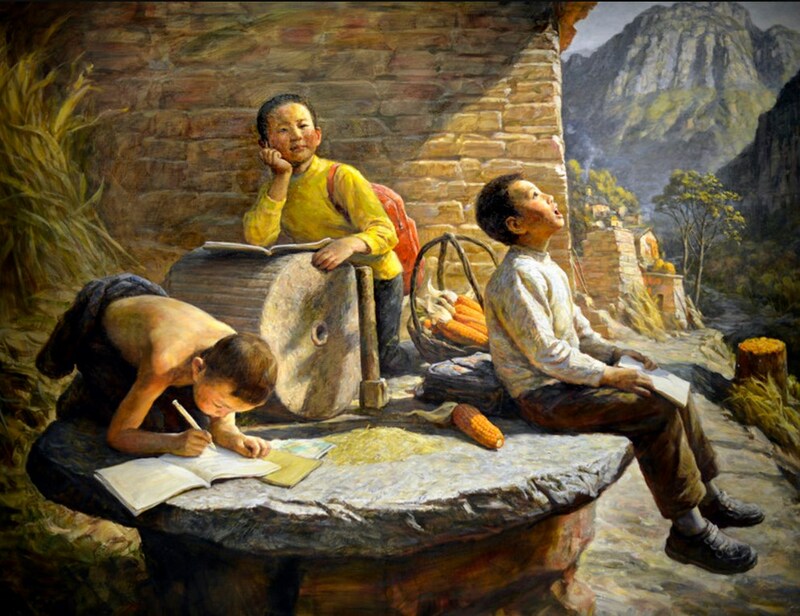 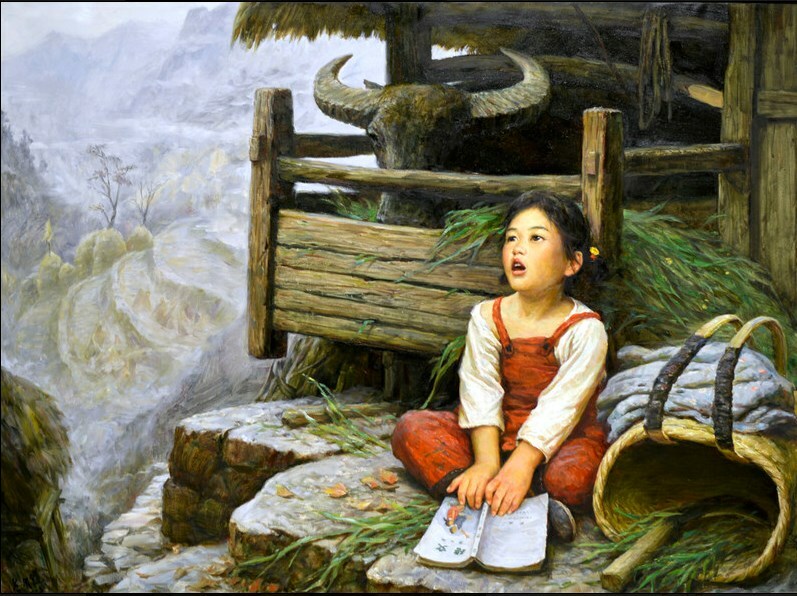 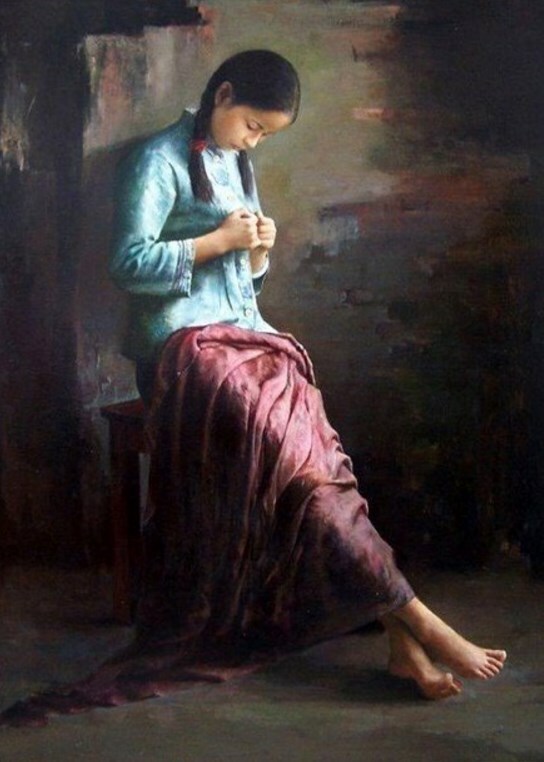 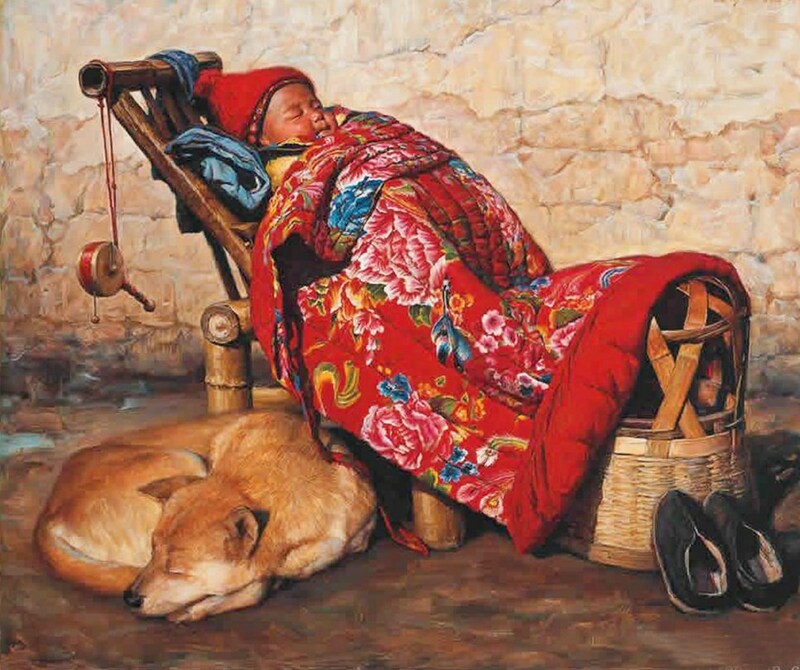 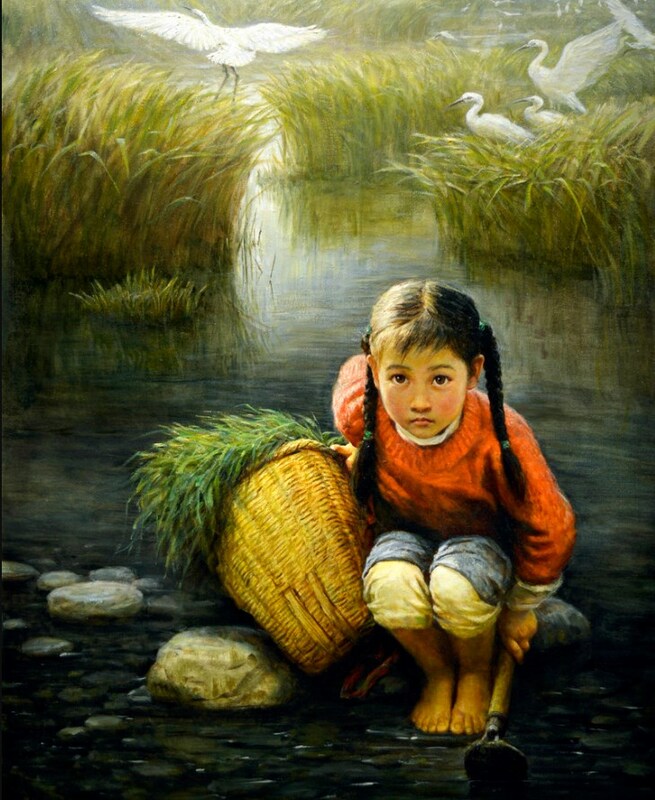 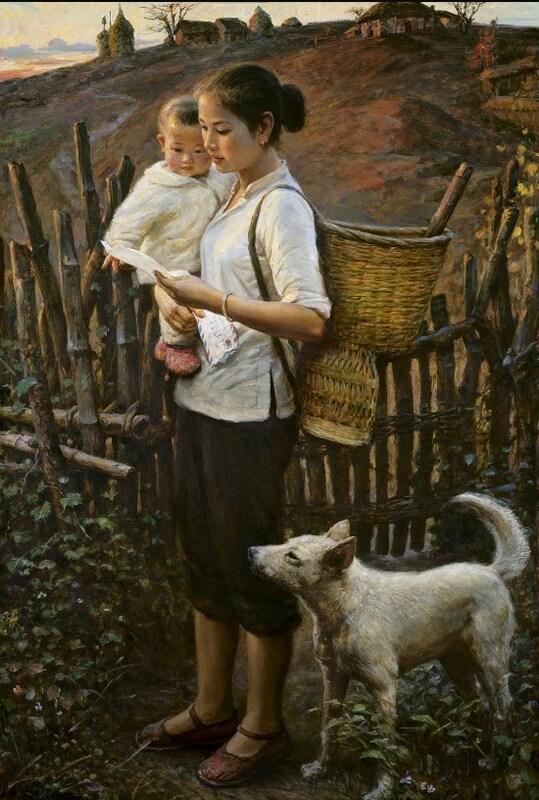 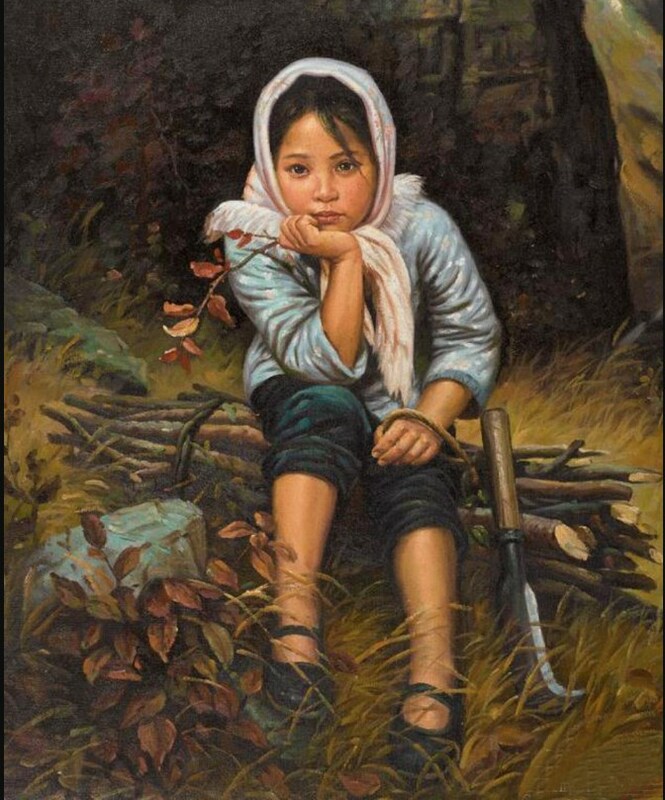 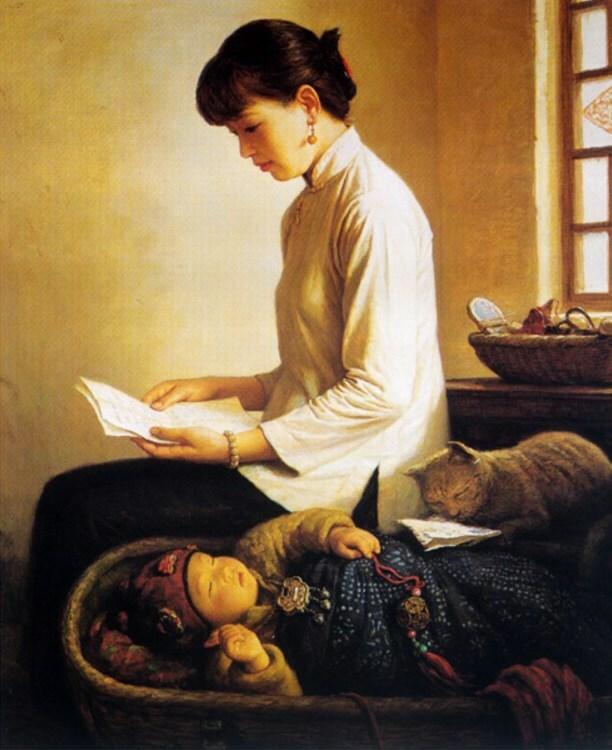 Although having lived in the United States for nearly 17 years, Li always concentrated his paintings on the native customs and people in China, especially those in his hometown. 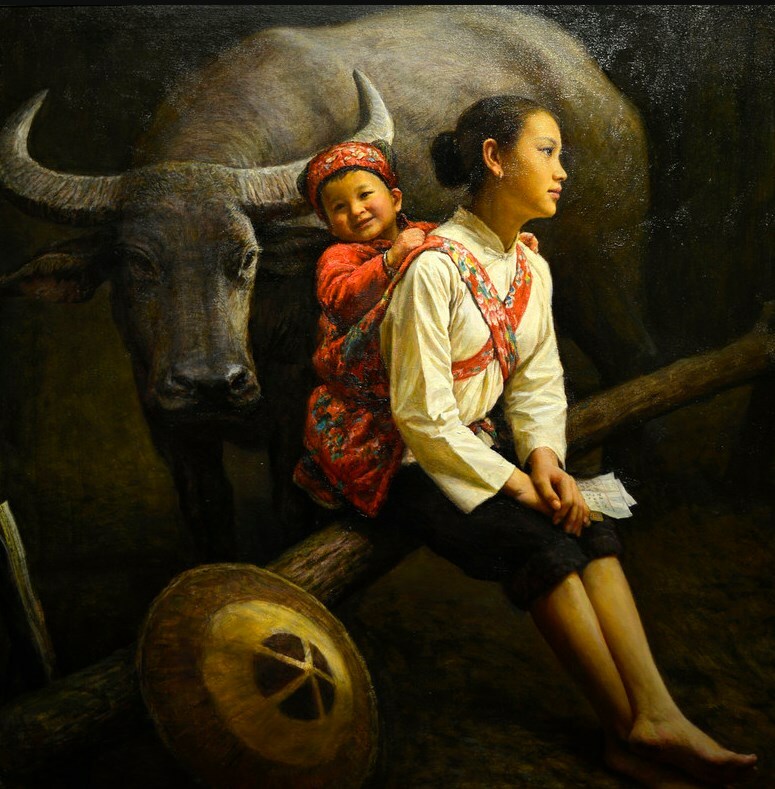 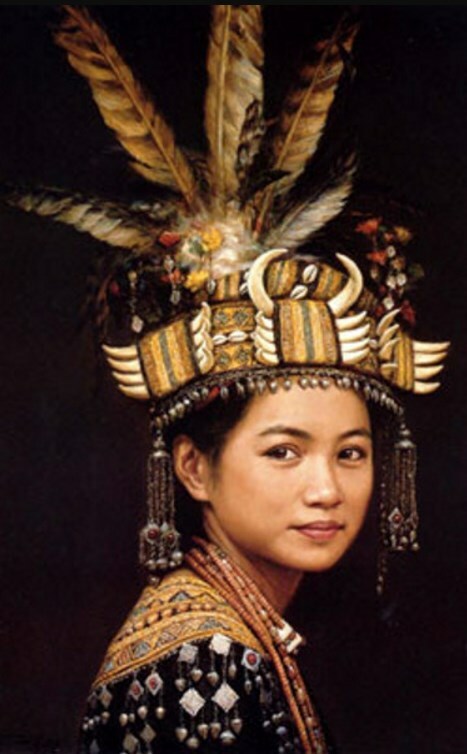 “The culture of my native Hunan has made a deep influence on me. 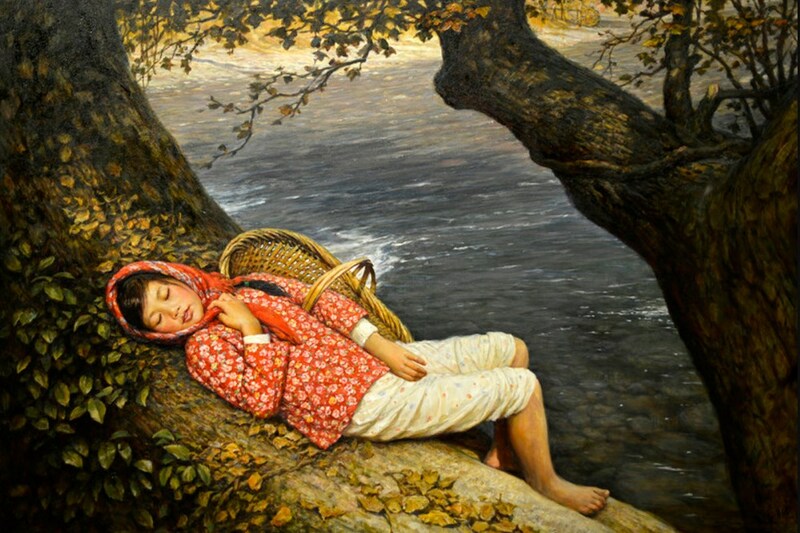 All simple and ancient buildings, rivers and the people in my hometown are endless source for my creation of works,” said Li. 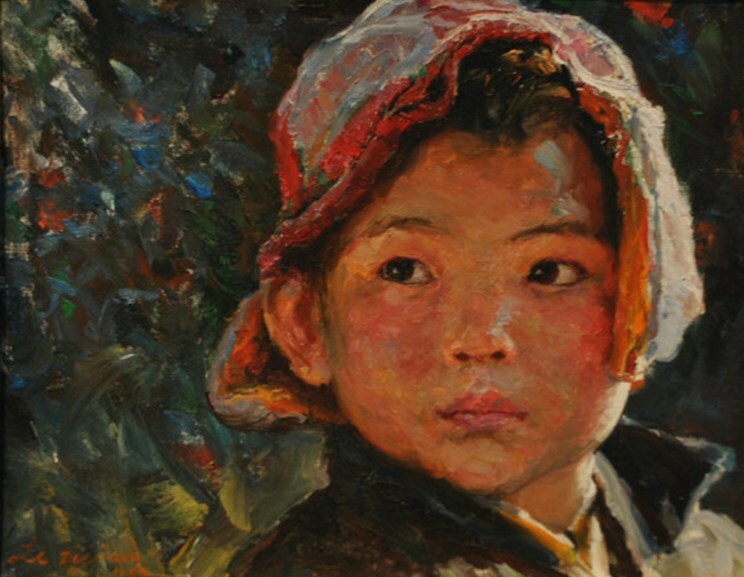 Having lived through poverty and various hardships, Li has emerged as an artist who is now a recognized master in his field. 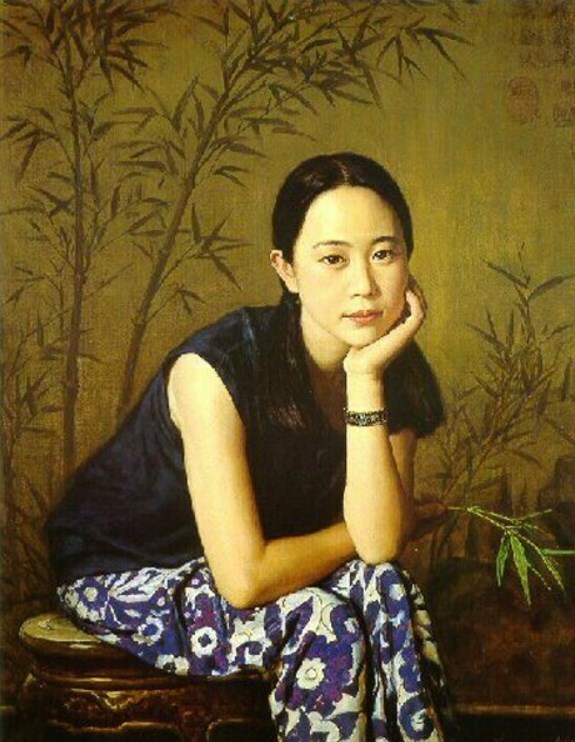 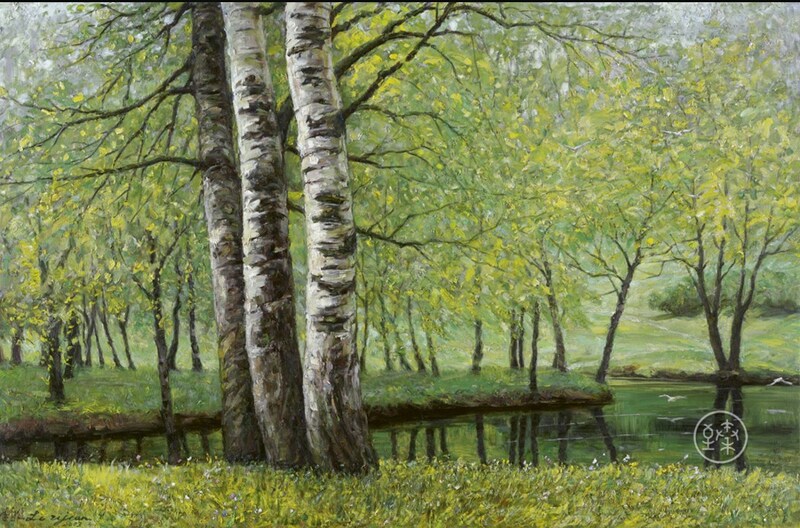 Throughout his painting career of over 30 years, Li has consistently adhered to an artistic spirit of simplicity and sincerity. 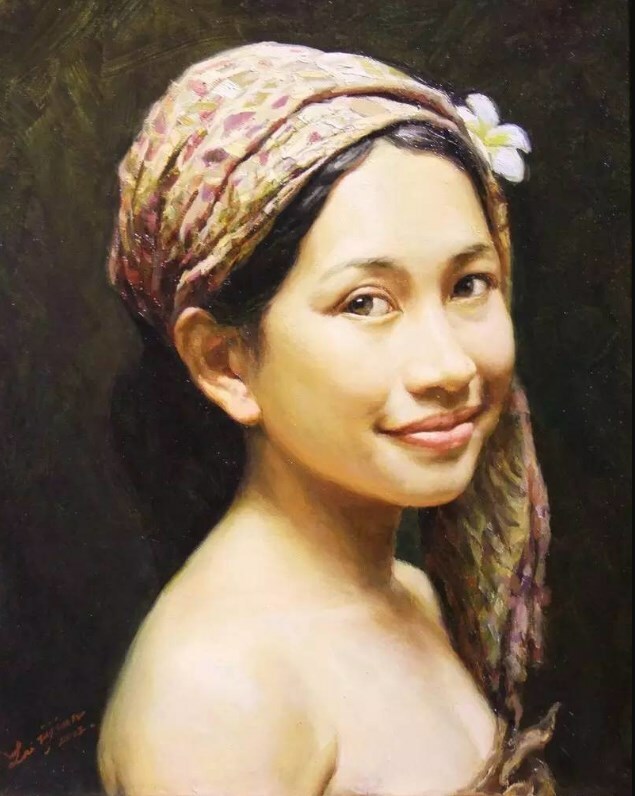 His deep and solid artistic substance, his enriching and at times uncertain life experiences and his hard work and unaffected character have led him to create his own artistic style which contains purity, beauty, and goodness. 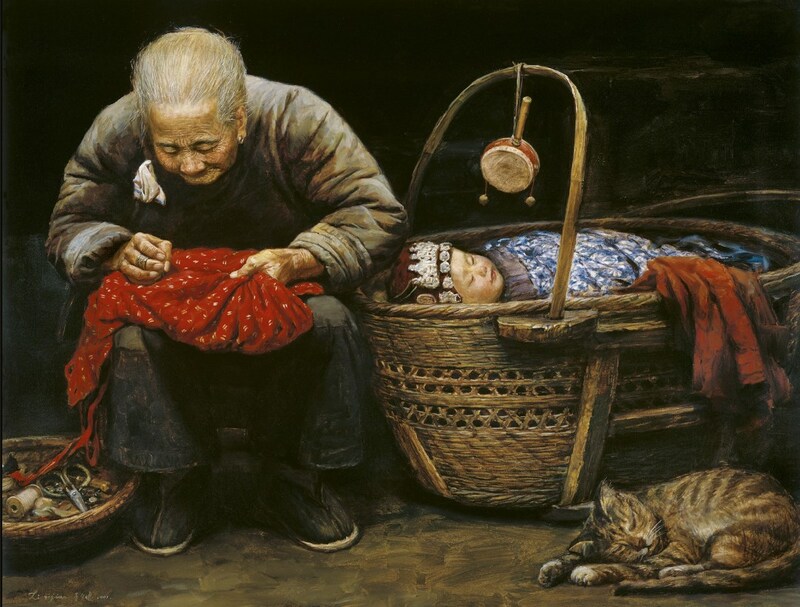 Li has created a series of paintings on the subject of “Humanity and Love” during the past 14 years. 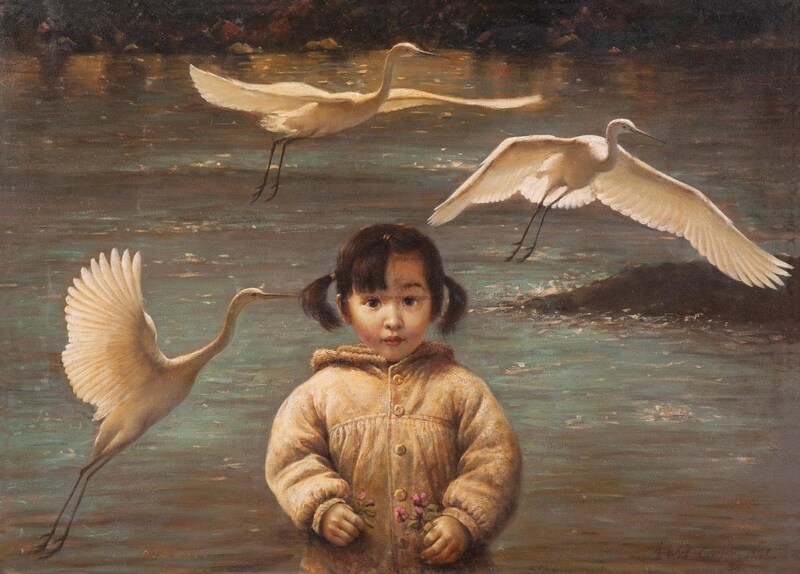 Since 1992, Li has held “Li Zijian World Tour Exhibition: Humanity and Love” in more than 20 countries and regions around the world. 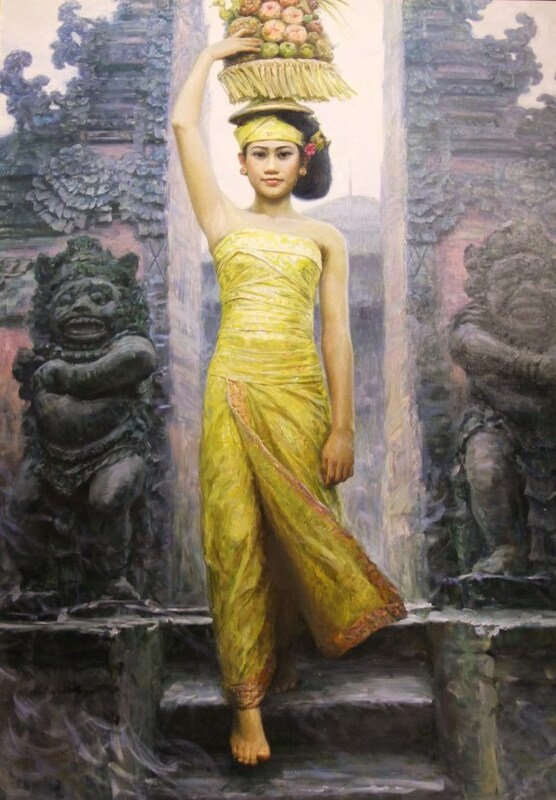 More than 1,500,000 people have visited these shows to see more than 100 masterpieces selected by the artist. 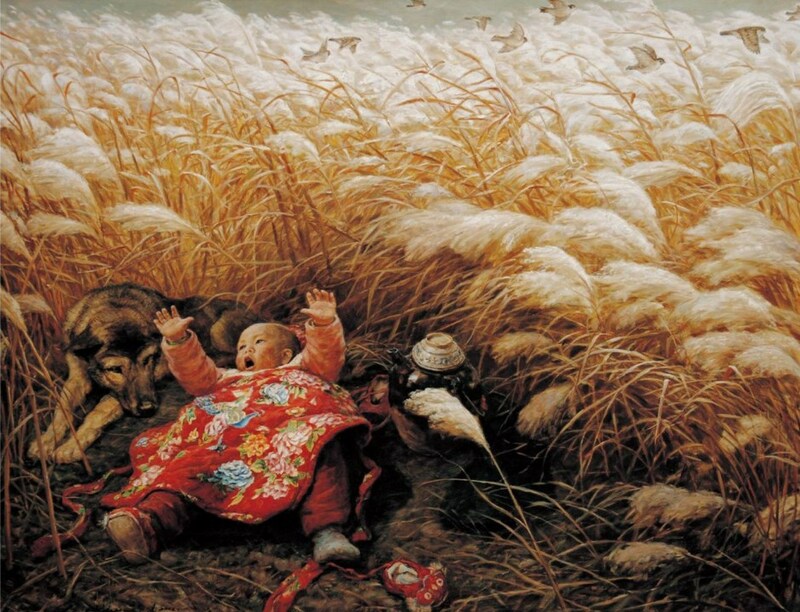 Unlike most of his works themed with calmness and beauty, “Nanjing Massacre” shocks every viewer: a little boy cries among a pile of dead bodies while a sad monk collects a corpse, with two Japanese invaders laughing with a bayonet still shines with blood. 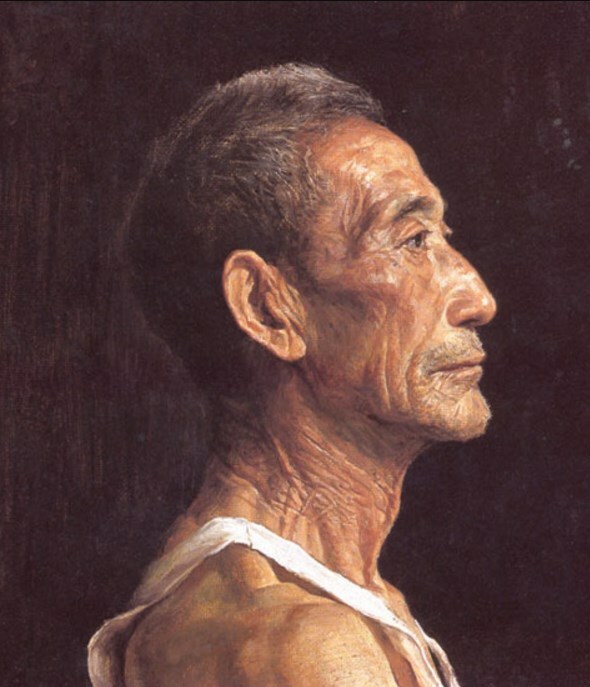 Li’s “Nanjing Massacre” has met warm response but also rejections and even threat from some Japanese who refused to acknowledge the history. 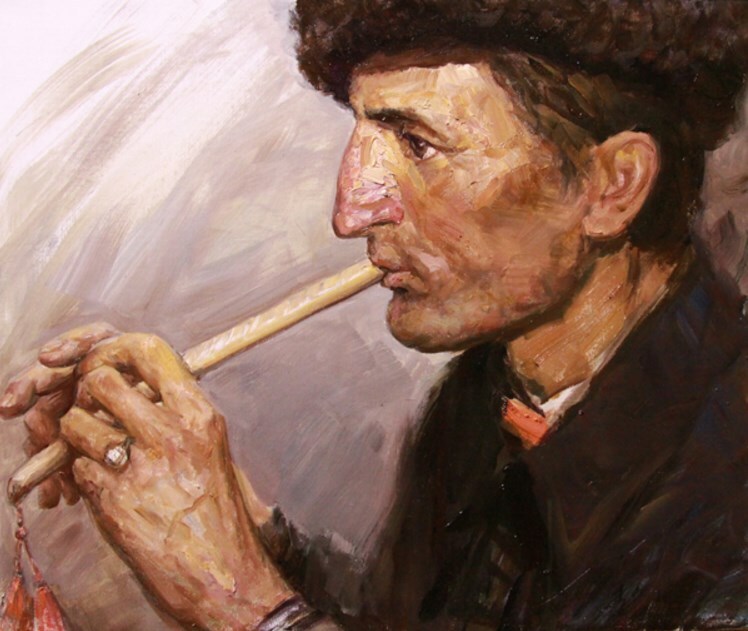 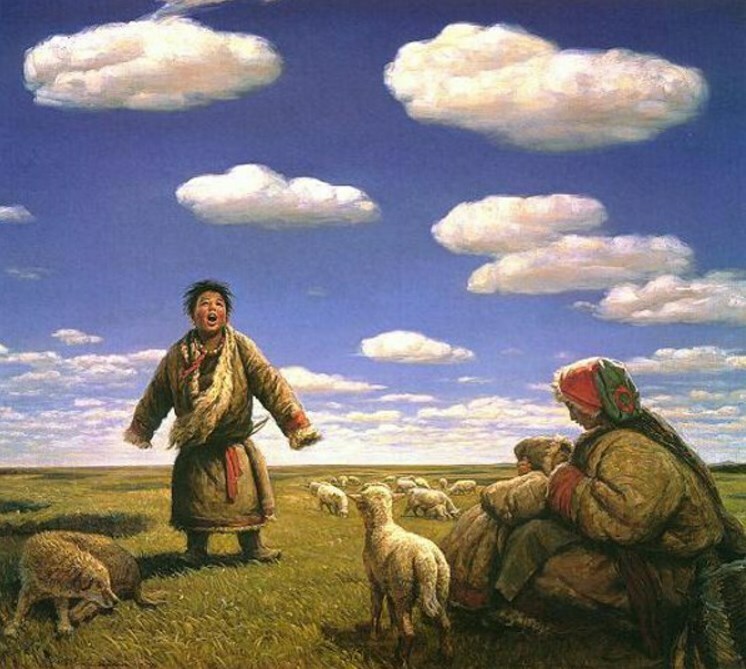 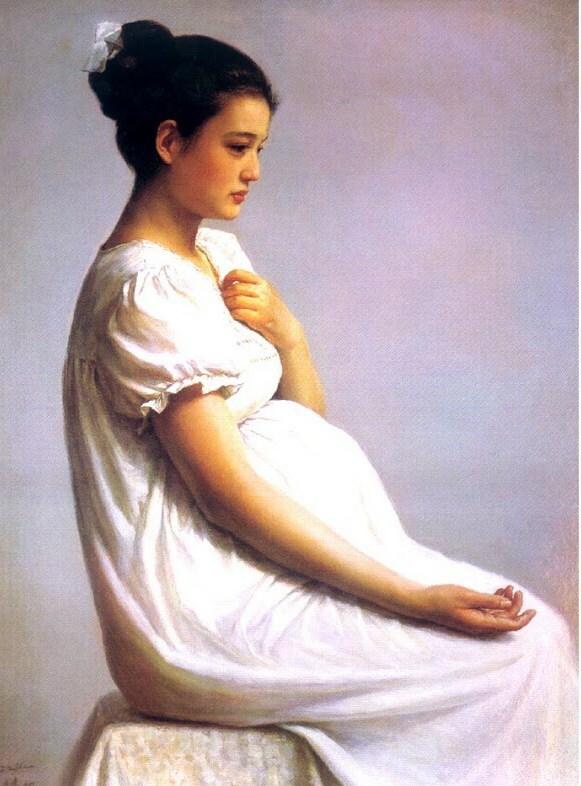 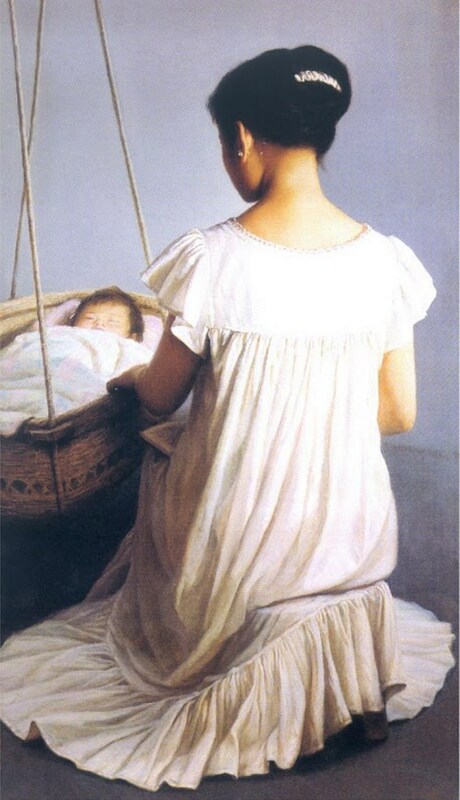 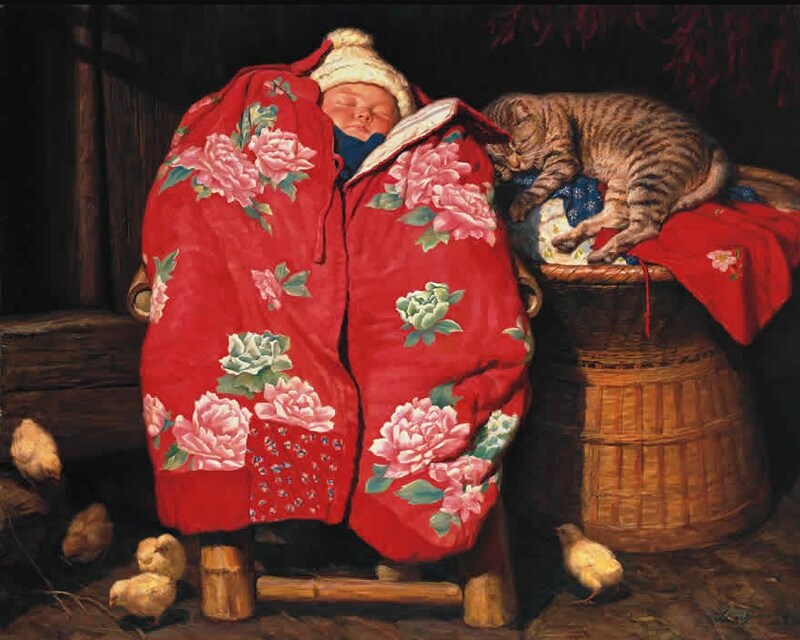 But Li insisted putting this painting in all his exhibitions. 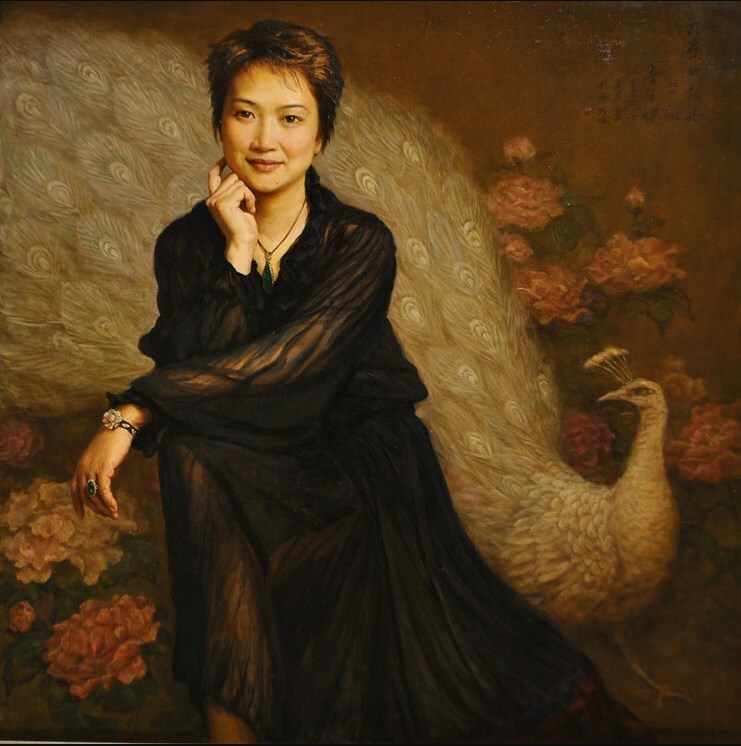 “I will continue doing this because that’s my responsibility to let the world know the true history of the Nanjing Massacre,” said Li calmly.